Good afternoon and thank you for coming to my talk today. The title of my talk is “Is this your book? What digitization does to manuscripts and what we can do about it.” However I want to make a small change to my title. 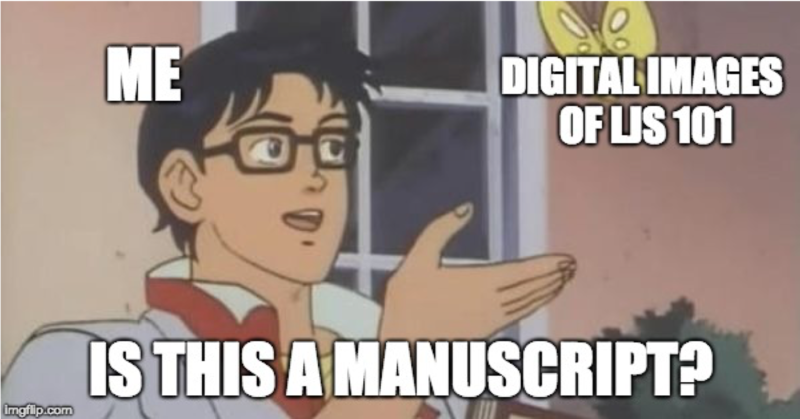 I’m not entirely sure if there’s anything we can do about what digitization does manuscripts but I do think we can think about it, so that’s what I want to do a bit today. 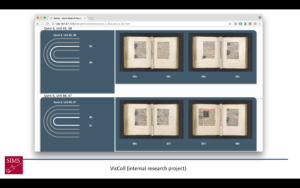 I want us to think about digitized books – specifically about digitized manuscripts, since that’s what I’m particularly interested in. So, like any self-respecting book history scholar, I’m going to start our discussion of digitized manuscripts by talking about memes. 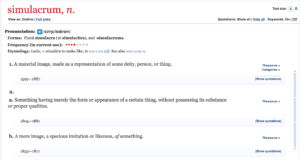 Definition of the word “meme” from the Oxford English Dictionary. The word meme was coined in 1976 by Richard Dawkins in his book The Selfish Gene. 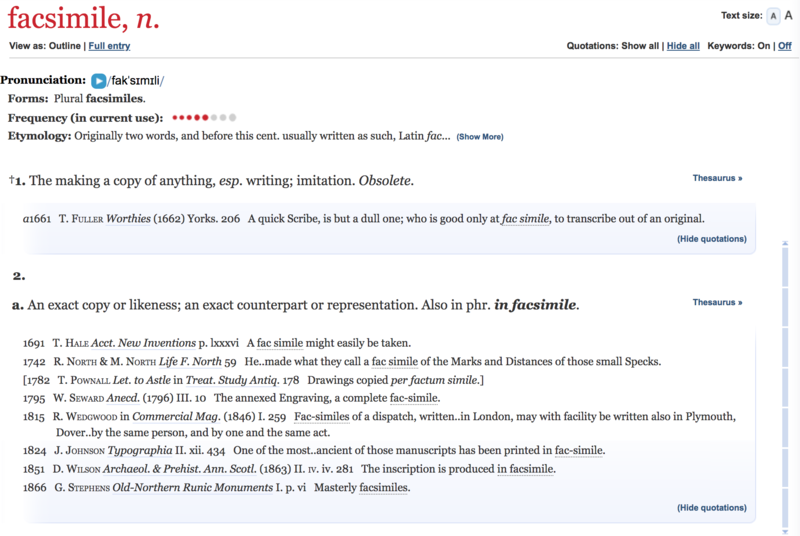 In the Oxford English Dictionary, meme is defined as “a cultural element or behavioral trait whose transmission and consequent persistence in a population, although occurring by non-genetic means (especially imitation), is considered as analogous to the inheritance of a gene.” Dawkins was looking for a term to describe something that had existed for millennia – as long as humans have existed – and the examples he gave include tunes, ideas, catchphrases, clothes fashions, ways of making pots or building arches. These are all things that are picked up by a community, ideas and concepts that move among members of that community, are imitated and modified, and which are frequently moved on to new communities as well where the process of imitation and modification continues. More recently the term meme has been applied specifically to images or text shared, often with modification, on the Internet, particularly through social media: If you’ve ever been RickRolled, you have been on the receiving end of a particularly popular and virulent meme. 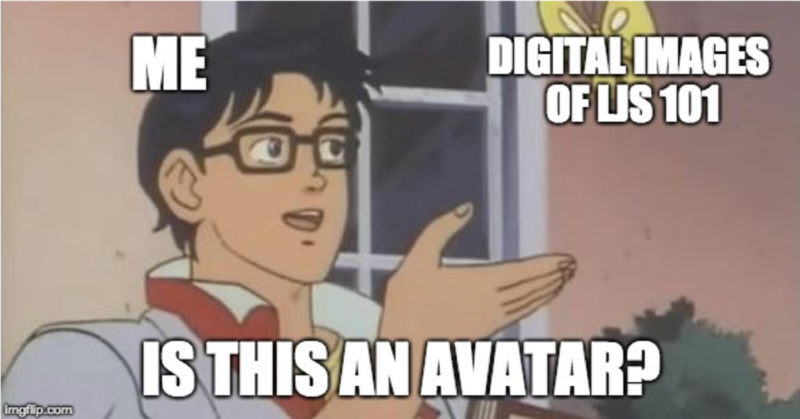 This is all very interesting, Dot (I hear you say), but what do memes have to do with digitized manuscripts? This is an excellent question. What I want to do now is look at a couple of specific examples of memes and think a bit in detail about how they work, and what it looks like to push the same idea through memes that are similar but that have slightly different connotations. Then I want to look at some different terms that scholars have used to refer to digitized manuscripts and think a bit about how those terms influence the way we think about digitized manuscripts (if they do). My proposition is that these terms, while they may not exactly be memes, function like memes in the way they are adapted and used within the library and medieval studies scholarly communities. So let’s see how this goes. In the film The Black Panther, which was released back in February of this year, there’s a scene where a character has come to the country of Wakanda to challenge the king for the throne. This character, N’Jadaka (also named Erik Stevens, but better known by his nickname Killmonger), is a cousin of the king, T’Challa, but was unknown to pretty much everyone in Wakanda until just before he arrives to make his challenge. 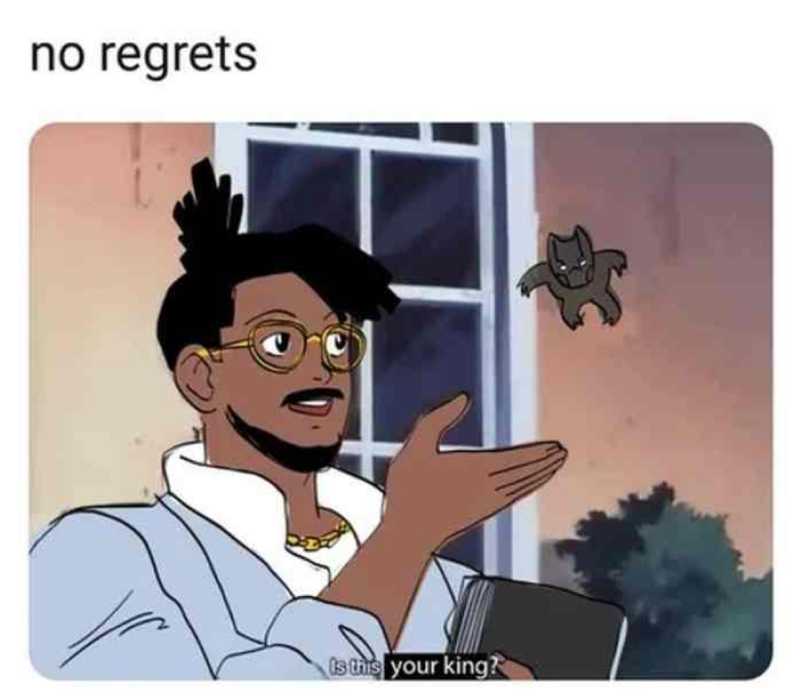 At the climax of this scene, during which Killmonger and T’Challa fight hand-to-hand in six inches of water, Killmonger – who is clearly winning – turns to the small audience of Wakandans gathered to witness the battle and exclaims, “IS THIS YOUR KING?” If you haven’t seen the film I’m about the spoil it for your: it turns out the answer to that question is NO. This is a phrase that was born to be a meme, and within a month that’s exactly what happened. 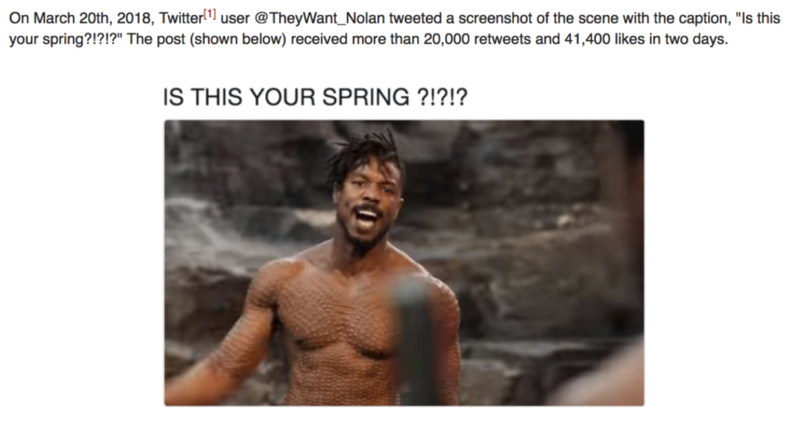 According to the Know Your Meme website the first instance of the “Is this your king” meme appeared on March 20 on Twitter when @TheyWant_Nolan tweeted a screen shot of the scene with the caption “is this your spring”. If you think back to March, the weather was pretty terrible everywhere around the country. It was long and tedious going back and forth between snow and heat then back to snow. 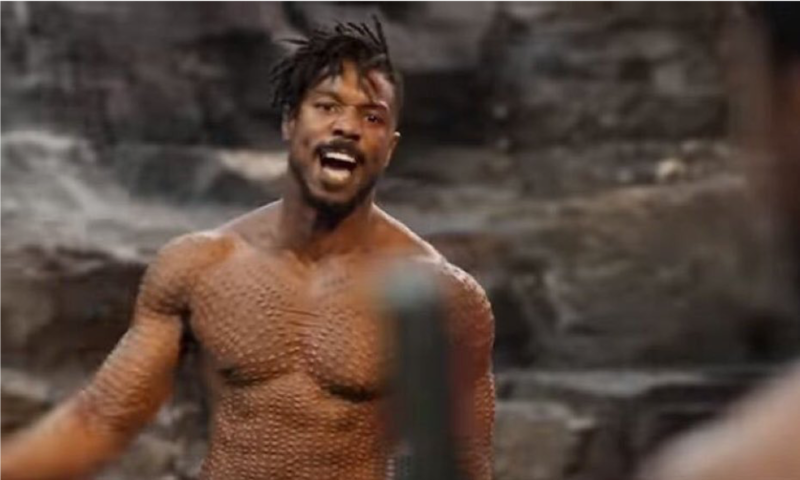 Is this your Spring? NOPE. This type of meme is a snowclone, defined as “a type of phrasal templates in which certain words may be replaced with another to produce new variations with altered meanings, similar to the “fill-in-the-blank” game of Mad Libs.” I would like to note here that this term, snowclone, was coined in 2004 by American linguists Geoffrey K. Pullum and Glen Whitman specifically to describe this phenomenon. The concept of a snowclone has been around for much longer than the term – think of “I’m not an X but I play one on TV” which was the most hilarious phrase when I was a kid – and the “Is this your king” meme works the same way, where we replace king with some other word to make a phrase that is understood to elicit a negative response. Here are some other examples of this meme featured on its Know Your Meme page. These all supply the identity of the question asker, they vary widely by topic, and one of them makes a slight modification to the image, but they all imply a negative response to the question. 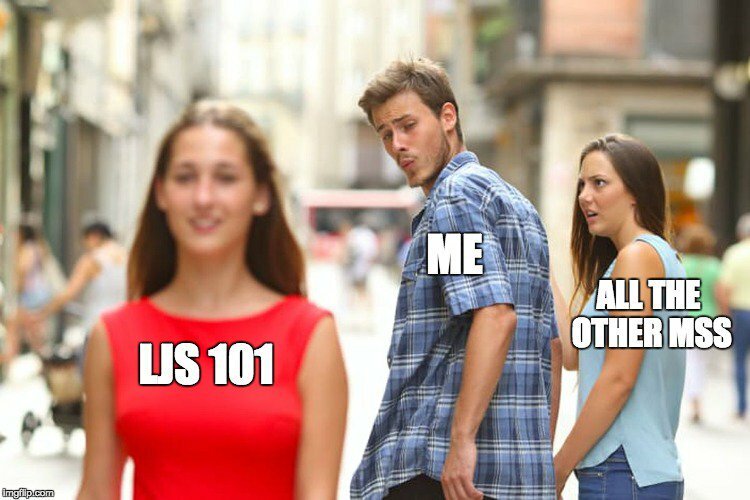 I made one myself. 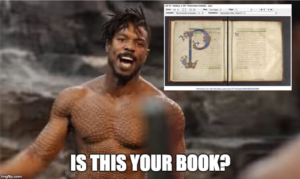 My meme features a screen shot of my favorite manuscript, UPenn LJS 101, as seen through the Penn in Hand manuscript interface. In my meme, the question asked is, is this your book? As we know from the context of the original meme, the answer to the question is no. This is not my book. Or: It’s not my real book. I’ve made a few other memes and for some reason most of them play with the relationship that a digitized version of a manuscript has with the physical object. Memes such as “Is this your king” and this next one, the “Is this a pigeon” meme, enable us to ask questions with assumed answers. 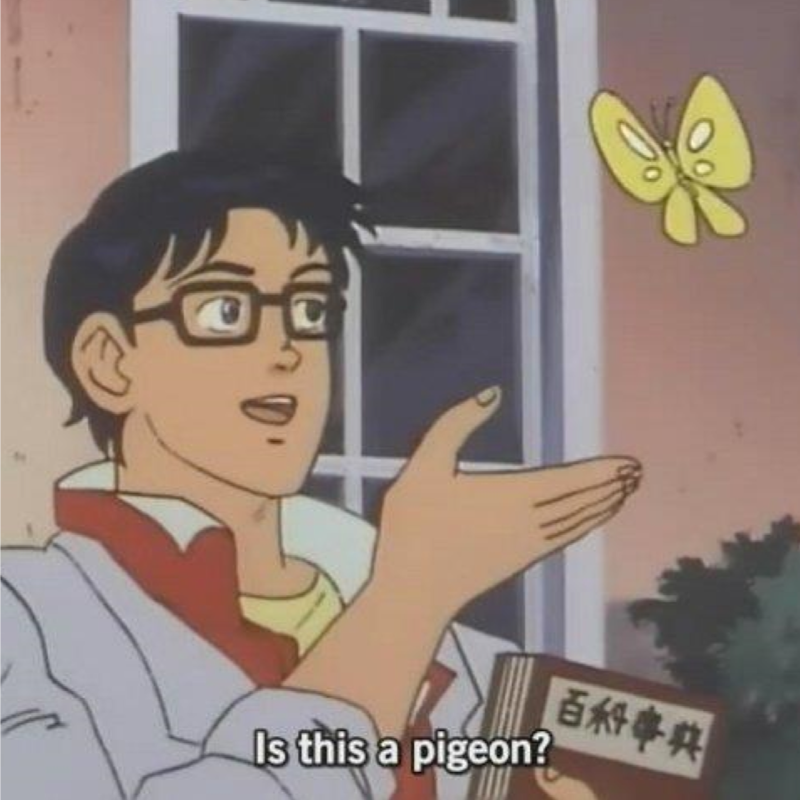 In this meme, the original scene is from an anime where a human-like android sees a butterfly and asks, “Is this a pigeon?” This is another snowclone, where the question asker, the object of the question, and the question itself can be replaced with almost literally anything else. I find these snowclone memes work well for my needs, though I find the differences between the emotions that these two memes elicit fascinating. 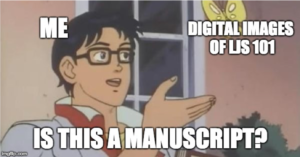 Although both of these memes can be used as a kind of mirror for us to view the relationship between a manuscript and its digitized version, they expect different responses and elicit different emotions, much as different words used to refer to the same situation or person might invoke different emotions. The memes are, in effect, acting as a kind of terminology, so now I want to pivot and talk about how terminology might act as memes. 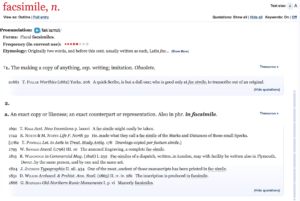 A scholar adopts the term because we need some way to describe this new thing that we’ve created. So we appropriate this term, with its existing meaning, and we use it to describe our new thing. The term itself becomes imbued with meaning from what we are now using it to describe. The next time someone uses that term, it carries along with it the new meaning. Some scholars take time to define their terms, but some scholars choose not to, instead depending on their audience to recognize the existing definitions and connotations of the terms they use. 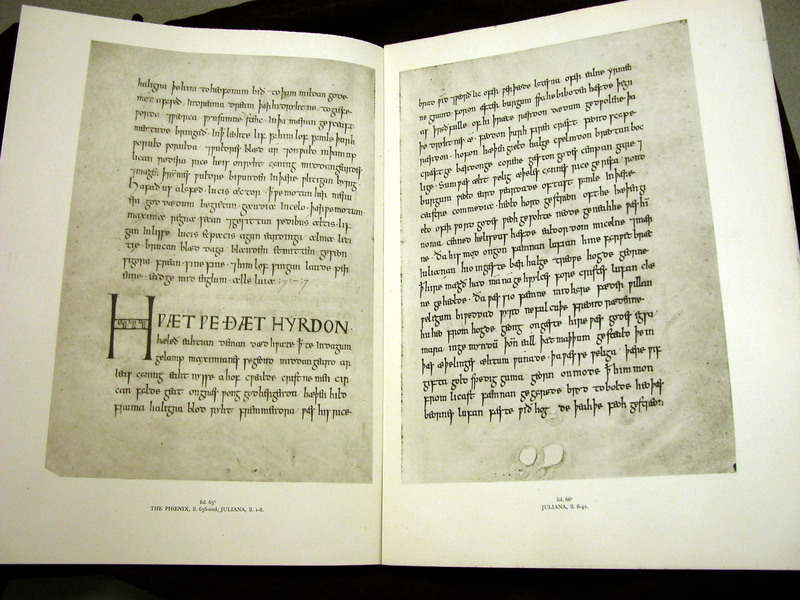 For example, in her 2013 article “Fleshing out the text: The transcendent manuscript in the digital age,” Elaine Treharne (coming out of a description of how medieval people would have always interacted with a physical book) says: “for the greater proportion of a modern audience on any given day, one has necessarily to rely on the digital replication: the world of the ironically disembodied and defleshed simulacrum, avatar, surrogate.” (Treharne, p. 470) [emphasis mine] Here Treharne uses the terms simulacrum, avatar, and surrogate without defining them, and she groups them together, in that order, placing simulacrum first in that list. 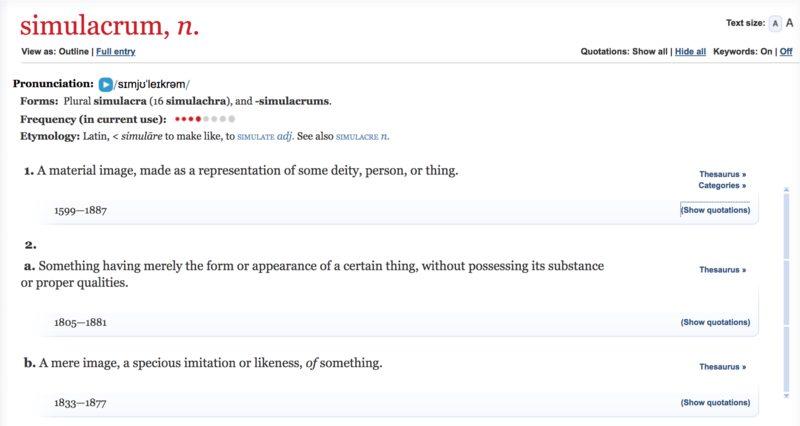 More than the other two, simulacrum has a negative connotation – as we can see from its entry in the OED, a simulacrum is a “mere image”; it looks like a thing without possessing its substance or proper qualities; it is a “specious imitation”. 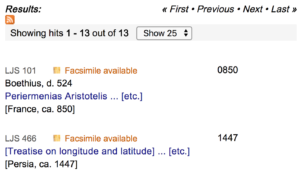 Although it is near identical in meaning and from related Latin roots as the term facsimile, which I’ll discuss in a moment, facsimile lacks the negative connotations that simulacrum has. Although the terms are undefined by the author, it seems that this was a purposeful word choice intended to elicit a negative response. 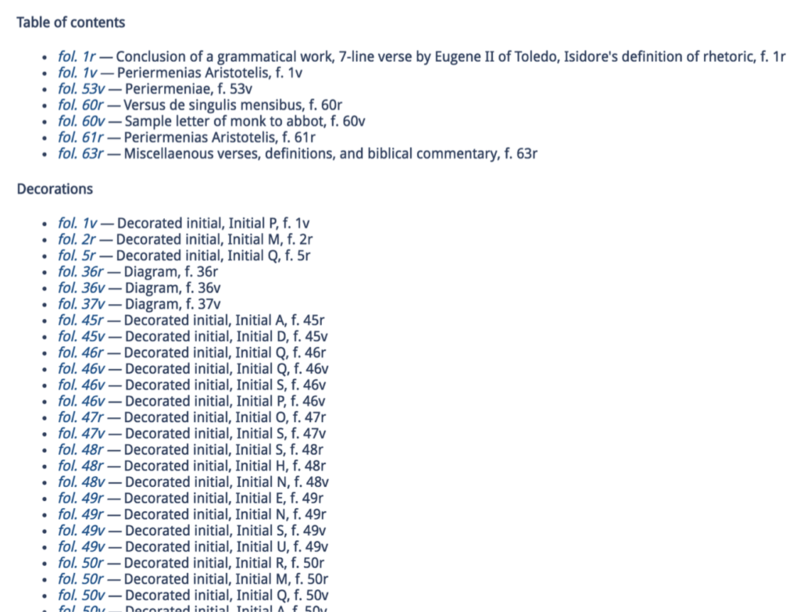 Compare this with Bill Endres, who in his 2012 article “More than Meets the Eye: Going 3D with an Early Medieval Manuscript” spends several paragraphs defining his terms and arguing for why he chooses to use some terms and not others. Endres says, “I will refer to 3D and 2D images as digital artifacts or digital versions, although not totally satisfied with either term as it relates to epistemology. I am tempted to refer to them as digital offspring, the results of a marriage between digital and manuscript technologies, with digital versions having unique qualities and a life of their own. This term is problematic but it speaks to the excesses, commonalities, and deficits when digital versions are measured against their physical antecedent.” (Endres, p. 4) Endres then discusses some other terms, including two of the ones I will consider in a moment, so we’ll return to his thoughts later. The point here is that Endres defines his terms and explains why he is using them, while Treharne relies on us to understand her meaning through the known definition of her terms. 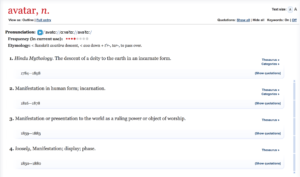 For each term I will discuss pre-digital definitions of the term, using the Oxford English Dictionary as the source. I’ll also include a few quotes where scholars refer to digitized manuscripts using that term, although these quotes are meant to be representative and not exhaustive (that is, I couldn’t tell you the first time that the term was used by someone to refer to a digitized manuscript, but I can give you an impression of how the term has been used or is being used currently). Let’s begin with the term facsimile. By the late 19th century, facsimile has been adapted to refer to the communication of images through radio, wire, or similar methods – the modern day “fax” machine, for example. This meaning maintains the previous definitions focusing on a facsimile as some kind of copy, but adds the meaning of communicating over distance, and I expect these combined uses of the terms – print facsimiles plus the sharing of images over distance – are why digital facsimile became an obvious term to use to describe these new representations of old objects. The term surrogate is interesting because, unlike facsimile – which is a fairly straightforward synonym for a copy – the term refers to something standing in for, or perhaps replacing, something else. until 1644 we have a general meaning substitute. Since the 1970s the term has been used in a more intimate way, to refer to sexual surrogates and surrogate mothers. As my colleague Bridget Whearty pointed out to me while we were discussing the word surrogate, the term is almost always used to describe bodies – either a person having power delegated to them, or a body acting as a substitute for another body. 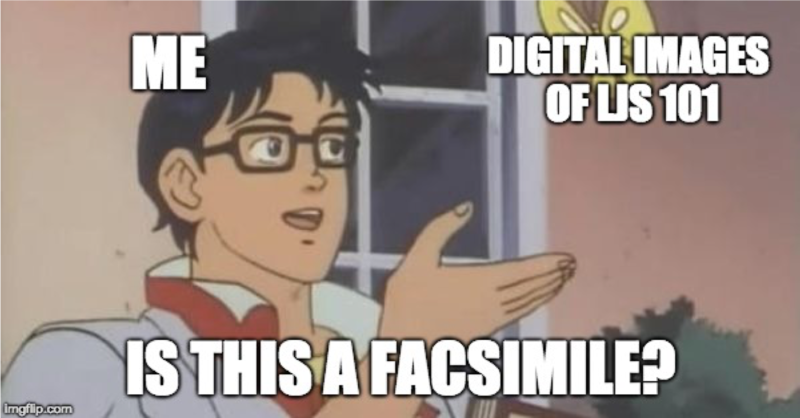 So the implication is that using this term to refer to digitized manuscripts doesn’t only mean the digital is standing in for the physical, but it also – by virtue of previous uses of the term – may imply some sort of embodiment or materiality of the digital object that is acting as the surrogate. Paul Conway has an extensive discussion of the digital surrogate in his 2014 article “Digital transformations and the archival nature of surrogates”, and although he is referring to archival materials and not medieval manuscripts, I would expect that the use of the term comes from the same place, so I will quote him here. 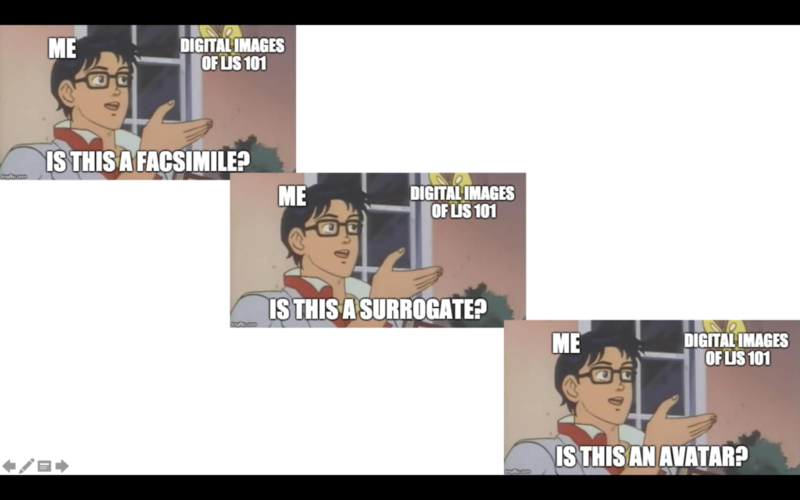 He reflects my own thoughts about a surrogate being more than a copy, saying “The creation of digital surrogates from archival sources is fundamentally a process of representation, far more interesting and complex than merely copying from one medium to another. Theories of representation – and the vast literature derived from them – are at the heart of many disciplines’ scholarship and of particular relevance for scholars who work primarily or exclusively in the digital domain.” (Conway pp. 2-3) He then continues to cite several other scholars – Mitchell, Scruton, Geoffrey Yeo, Matthew Kirschenbaum, Michael Taussig, and Johanna Drucker – who discuss the relationship that digital copies continue to have with their sources well after they have been created, even as they have their own materialities. Bill Endres, who I quoted above, continues his thoughtfulness in the same piece as he considers surrogate as a term for his own use in describing 3D images of manuscripts. He says, “a term that has gained some commonality in 3D is digital surrogate. Bernard Fischer uses the term for 3D renderings of archaeological sites, like the impressive Rome Reborn. Fischer’s interest in 3D is to construct digital cityscapes and large spaces, thus his use of surrogate, the virtual environment functioning as a substitute or proxy, a stand in for the likes of a dig site or what once was, like ancient Rome, as a means to generate and test hypotheses, fulfilling a specific epistemic function. Surrogate fits Fischer’s needs but does not speak as readily to the full range of epistemic considerations that I want to explore for a manuscript, particularly the excesses of a digital artifact that add to our knowledge in other ways and its effect on looking and knowing.” (Endres, p. 4) The excesses that Endres is referring to here are things like special lighting and the affordances of 3D imaging, and he feels that the term surrogate isn’t sufficient to include these things, although Endres’s excesses and are very similar to those things that Kiernan was thinking of in 1993 when he used the term electronic facsimile. 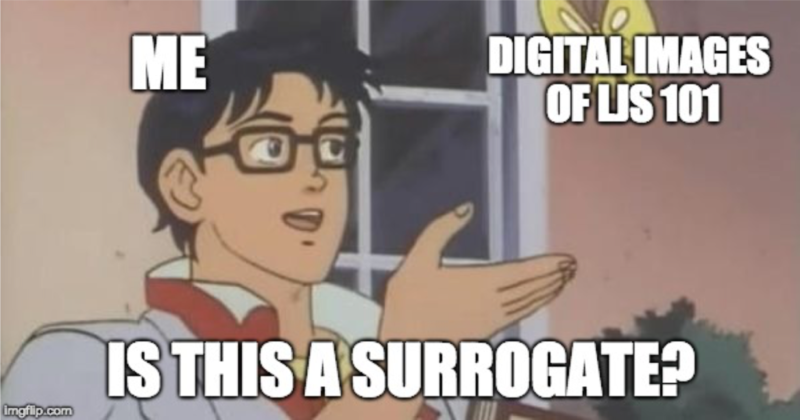 However Kiernan did not use the term surrogate in 1993 – it would be interesting to see when the term surrogate was first used to refer to digital objects, and if it would have been available to Kiernan in 1993. 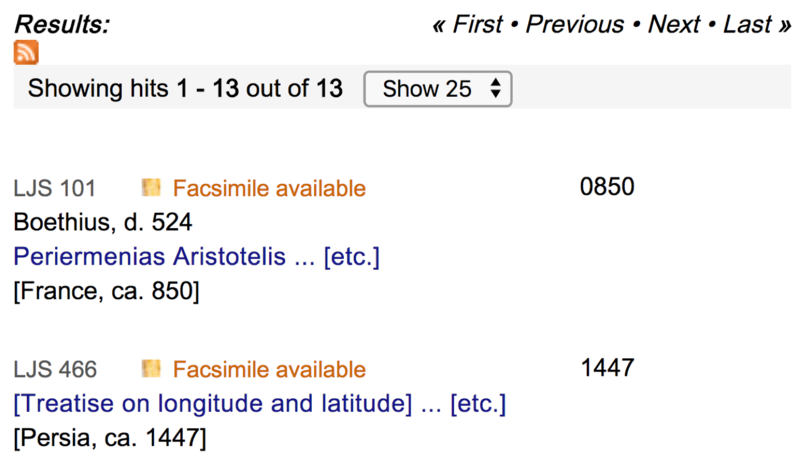 The third term, avatar, is relatively new to me, although Sian Echard used it in the chapter quoted above, and the term was also used by classicist Ségolène M. Tarte, in her 2011 presentation “Interpreting Ancient Documents: Of Avatars, Uncertainty and Knowledge Creation,” and is also mentioned by Endres and very recently by Michelle Warren, in a just-published article “Remix the Medieval Manuscript: Experiments with Digital Infrastructure.” This term is not yet common, but it may be gaining purchase because of its inherent complexity. 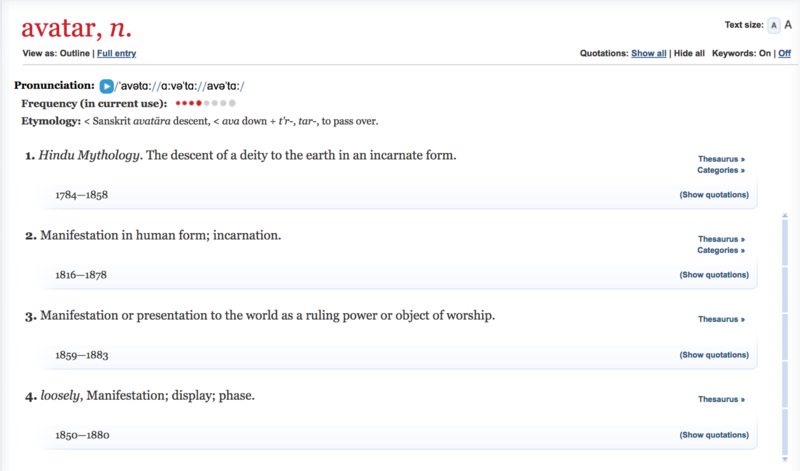 I really like avatar because of the connotations brought along with its original definition. 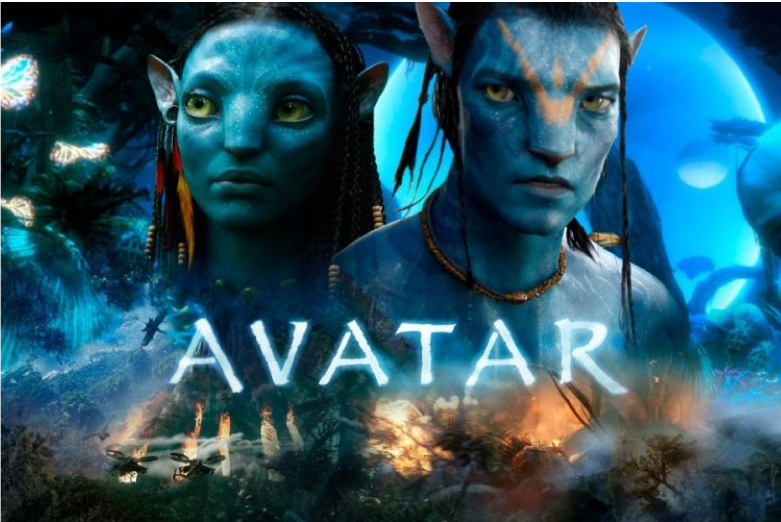 According to Hindu mythology, an avatar is the incarnate, human manifestation of a deity. It is thus the avatar that is embodied, not the thing that the avatar represents. This can be contrasted with the term surrogate, which is also embodied, but the surrogate embodiment is in replacement of something else, while the embodiment of the avatar is the same thing, but in different form. And compare both of these again with facsimile, which again is a copy – these are three very different terms, and yet we have the desire to apply these terms to… if not the exact same things, than at least to the same kind of things. The term avatar has also been used to mean more generally a manifestation, and I actually think that this is the usage of the term that is closest to its application to digitized manuscripts, although there is another recent usage that is relevant: avatar as a term to describe a character in a computer game on environment, a character that represents a person or a player within that virtual environment (think of Second Life, or, to use a more current example, Minecraft). 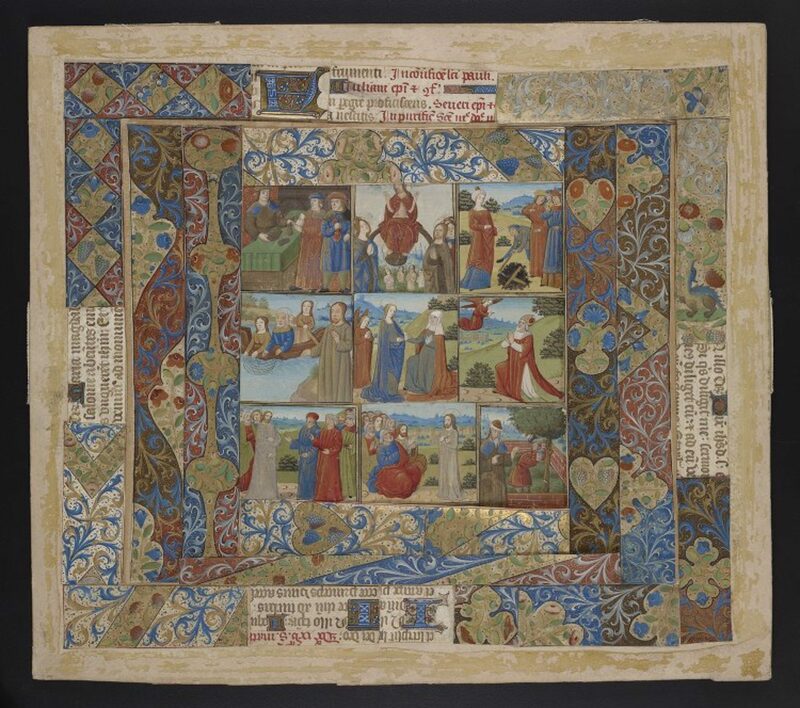 So what is an avatar when it comes to medieval manuscripts? 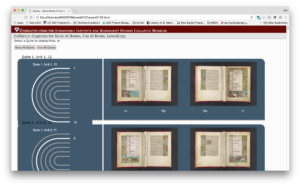 Echard uses the term to refer both to physical objects and to digital ones, first describing the digital avatars of the Sherborne Missal included in the British Library exhibit celebrating its purchase. 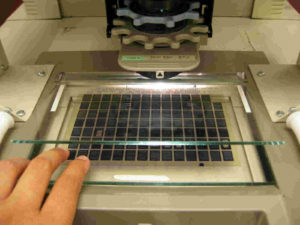 These include large-screen installations in the Library gallery, a CD-Rom available for purchase, an online version, and a 3D animation sequence that plays as an introduction to the CD-ROM. However as Echard says, “The avatars for these rare objects have … been books themselves- manipulable, tangible, physical … the physicality of the book is part of its cultural role, whether as public object or private delight. The digital facsimiles I have discussed here all attempt in one way or another to offer these medieval and early modem books to the fulfilling of both roles, and yet I would argue that they are ultimately stymied by the requirement to disembody the objects they display. The resulting tension, between access and absence, creates the ghosts that haunt the digital realm.” (Echard, p. 214) I’ve always loved this description of the tension of digitized manuscripts, and I am tickled to notice only now that the term avatar as attached to it. Before I conclude, I would like to remark on our apparent desire as a community to apply meaning to digital version of manuscripts by using existing terms, rather than by inventing new terms. After all, we coin new words all the time – just in this paper, I’ve mentioned snowclone and meme, so it would be understandable if we decided to make up a new term rather than reusing old ones. But as far as I know we haven’t , and if anyone has it hasn’t caught up enough to be reused widely in the scholarly community. I expect this comes from a desire to describe a new thing in terms that are understandable, as well as to define the new thing according to what came before. After all, both snowclone and meme are terms for things that have existed long before there were words for them, while digital versions of manuscripts are new things that have a close relationship with things that existed before, so while we want to differentiate them we also want to be able to acknowledge their similarities, and one way to do that is through the terms we call them. 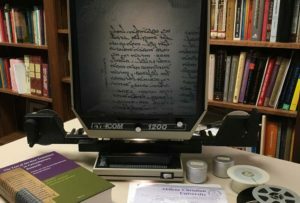 Although we use these three terms – facsimile, surrogate, and avatar – to refer to digitized manuscripts, it is clear that these terms don’t mean the same thing, and that by choosing a specific term to refer to digitized manuscripts we are drawing attention to particular aspects of them. 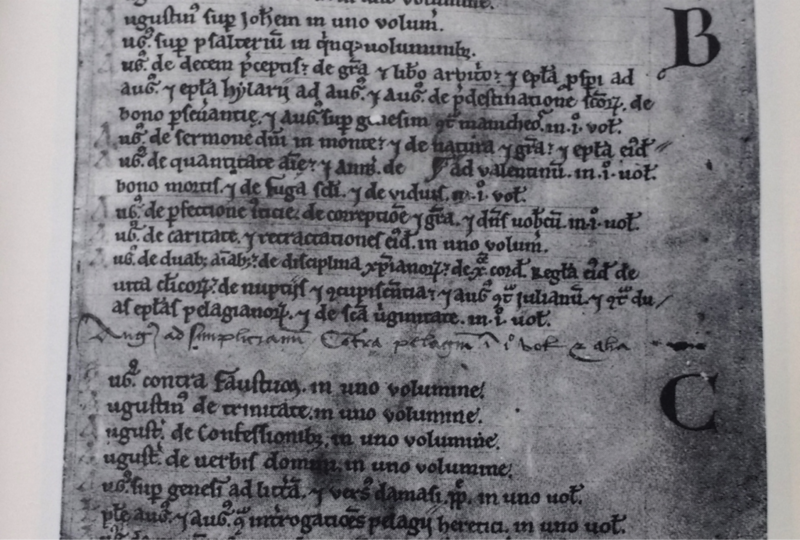 If I call a digitized manuscript a facsimile, I draw attention to its status as a copy. If I call it a surrogate, I draw attention to its status as a stand-in for the physical object. And if I call it an avatar, I draw attention to its status as a representation of the physical object in a digital world. Not a copy, not a replacement, but another version of that thing. 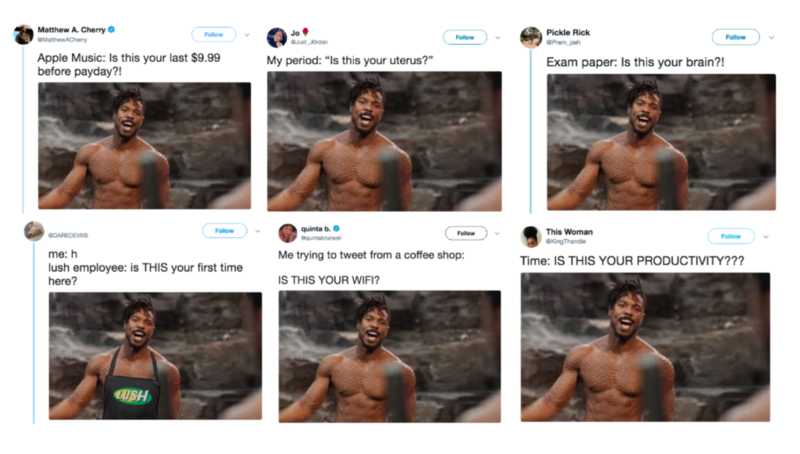 Like pushing an idea through different memes, pushing the concept of a digitized manuscript through different terms give us flexibility in how we consider them and how we explain them, and our feelings about them, to our audiences. 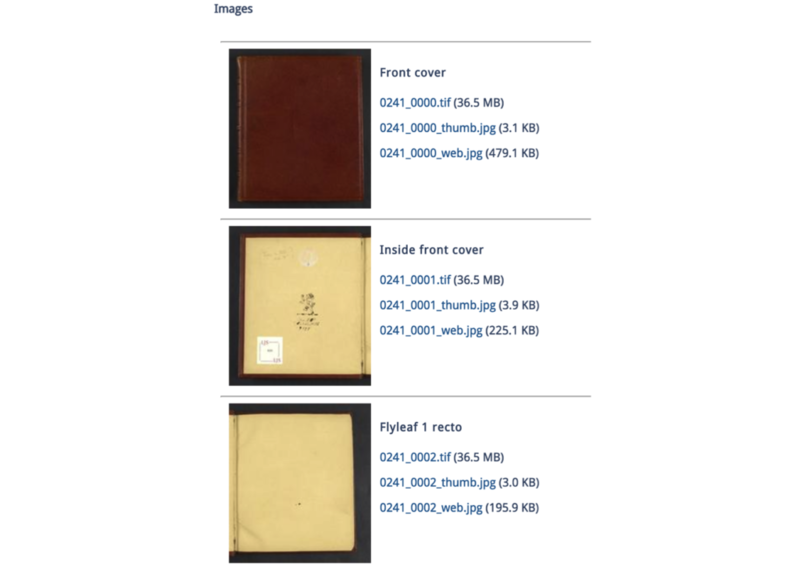 That we can so easily apply terms with vastly different meanings to the digital versions of manuscripts says something about the complexity of these objects and their digital counterparts. Sincere thanks to Bridget Whearty, Keri Thomas, Johanna Green, and Anna Levine, for their help getting this paper ready for the public eye. In the paper presented at the Rare Book School (which was recorded; I will add a link here when it becomes available) I used the Historical Thesaurus of English as the source for the term definitions, but I found during further editing that the Thesaurus timelines weren’t doing what I needed them to. If I continue this work, I expect to bring the timelines back in again. This is a version of a paper presented at the International Congress on Medieval Studies, May 12, 2018, in session 482, Digital Skin II: ‘Franken-Manuscripts’ and ‘Zombie Books’: Digital Manuscript Interfaces and Sensory Engagement, sponsored by Information Studies (HATII), Univ. of Glasgow, and organized by Dr. Johanna Green. The uncanny valley was described by Masahiro Mori in a 1970 article in the Japanese journal Energy, and it wasn’t translated into English completely until 2012. In this article, Mori discusses how he envisions people responding to robots as they become more like humans. The article is a thought piece – that is, it’s not based on any data or study. In the article, which we’ll walk through closely over the course of this presentation, Mori posits a graph, with human likeness on the x axis and affinity on the y axis. Mori’s proposition is that, as robots become more human-like, we have greater affinity for them, until they reach a point at which the likeness becomes creepy, or uncanny, leading to a sudden dip into negative affinity – the uncanny valley. Now, Mori defined the uncanny valley specifically in relation to robotics, but I think it’s an interesting thought exercise to see how we can plot various presentations of digitized medieval manuscripts along the affinity/likeness axes, and think about where the uncanny valley might fall. In my mind, the models created by Turning the Pages™ fall at the nadir of the “uncanny valley of digital texts” – which has perhaps a plain text transcription at one end and the original manuscript at the other end, with print facsimiles and editions, and the various digital displays and visualizations presented earlier in this paper falling somewhere between the plain text and the lip above the chasm. Nine years of thinking on this and learning more about how digital manuscripts are created and how they function, I’m no longer happy with this arrangement. Additionally, in 2009 I was working with imperfect knowledge of Mori’s proposition – the translation of the article I referred to then was an incomplete translation from 2005, and included a single, simplified graph in place of the two graphs from the original article – which we will look at later in this talk. Fourth, the graph refers to robots and to humans generally, not robots compared to a specific human. Mori’s article is divided into four sections, the first being “A Valley in One’s Sense of Affinity”. In this section Mori describes what he means by affinity and how affinity is affected by sensory input. Figure one in this section is the graph we saw before, which starts with an Industrial Robot (little likeness, little affinity), then a Toy Robot (more likeness, more affinity), then drops to negative affinity at about 80-85% likeness, with Prosthetic Hand at negative affinity and Bunraku Puppet on the steep rise to positive affinity and up to Healthy Person. I don’t think that, on close inspection, a bunraku puppet appears similar to a human being. Its realism in terms of size, skin texture, and so on, does not even reach that of a realistic prosthetic hand. But when we enjoy a puppet show in the theater, we are seated at a certain distance from the stage. The puppet’s absolute size is ignored, and its total appearance, including hand and eye movements, is close to that of a human being. So, given our tendency as an audience to become absorbed in this form of art, we might feel a high level of affinity for the puppet. 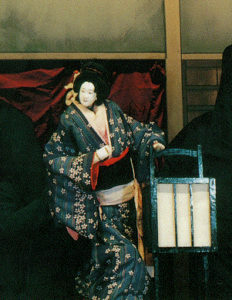 So it’s not that bunraku puppets look like humans in great detail, but when we experience them within the context of the puppet show they have the affect of being very human-like, thus they are high on the human likeness scale. In regards to reading experience, reading a digital facsimile could not be farther from the experience of reading from the Dotty Dimple box set. The digital facsimile does in truth feel like reading a “zombie book”. While every page is exactly the same as the original copy in the libraries of the University of Minnesota, it feels as though the book has lost its character. When I selected my pet book from Special Collection half of the appeal of the Dotty Stories was the small red box they came in, the gold spines beckoning, almost as if they were shouting out to be read. This facsimile, on the other hand, feels like a taxidermy house cat; it used to be a real thing, but now it feels hollow, and honestly a little weird. Sean has found the uncanny valley without even knowing it exists. The second section of Mori’s article, and where I think it really gets interesting for thinking about digitized manuscripts, is The Effect of Movement. In the first section we were talking in generalities, but here we see what happens when we consider movement alongside general appearance. Manuscripts, after all, are complex physical objects, much as humans are complex physical objects. Manuscripts have multiple leaves, which are connected to each other across quires, the quires which are then bound together and, often, connected to a binding. So moving a page doesn’t just move a page, much as bending your leg doesn’t just move your leg. 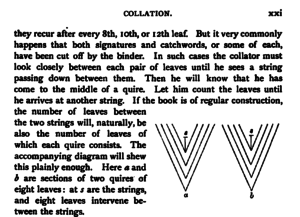 Turning the leaf of a manuscript might tug on the conjoined leaf, push against the binding, tug on the leaves preceding and following – a single movement provoking a tiny chain reaction through the object, and one which, with practice, we are conditioned to recognize and expect. Movement is fundamental to animals— including human beings—and thus to robots as well. Its presence changes the shape of the uncanny valley graph by amplifying the peaks and valleys (Figure 2). For illustration, when an industrial robot is switched off, it is just a greasy machine. But once the robot is programmed to move its gripper like a human hand, we start to feel a certain level of affinity for it. I expect most of us here have seen zombie movies, so, in the same way we’ve been conditioned to recognize how manuscripts move, we’ve been conditioned to understand when we’re looking at “normal” humans and when we’re looking at zombies. They move differently from normal humans. It’s part of the fun of watching a zombie film – when that person comes around the corner, we (along with the human characters in the film) are watching carefully. Are they shuffling or just limping? Are they running towards us or away from something else? It’s the movement that gives away a zombie, and it’s the movement that will give away a zombie manuscript. I want to take a minute to look at a manuscript in action. 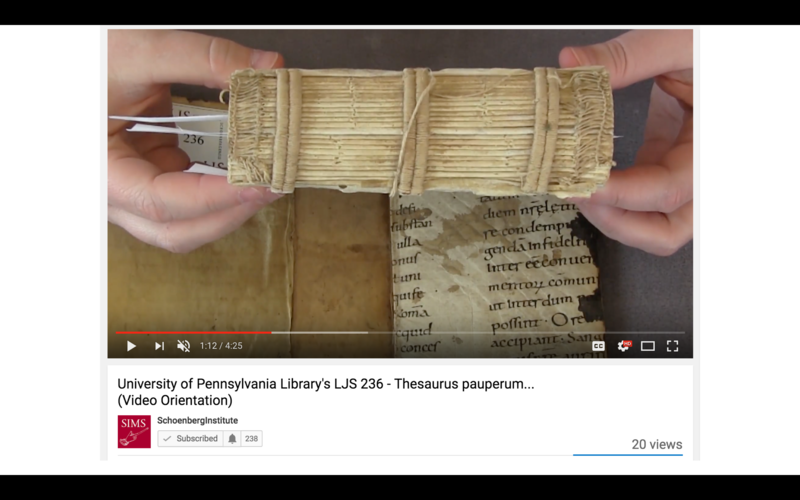 This is a video of me turning the pages of Ms. Codex 1056, a Book of Hours from the University of Pennsylvania. This will give you an idea of what this manuscript is like (its size, what its pages look like, how it moves, how it sounds), although within Mori’s conception this video is more similar to a bunraku puppet than it is like the manuscript itself. It’s a copy of the manuscript, showing just a few pages, and the video was taken in a specific time and space with a specific person. If you came to our reading room and paged through this manuscript, it would not look and act the same for you. 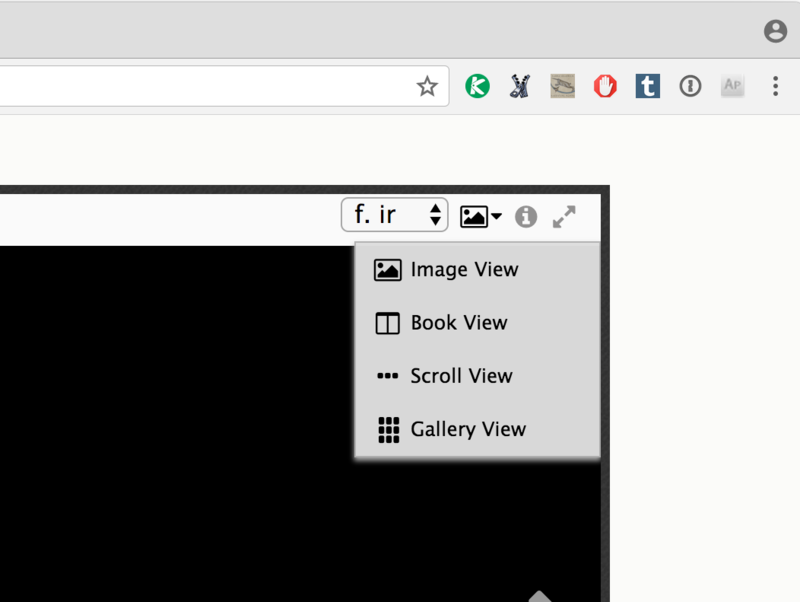 Now let’s take a look at a few examples of different page-turning interfaces. 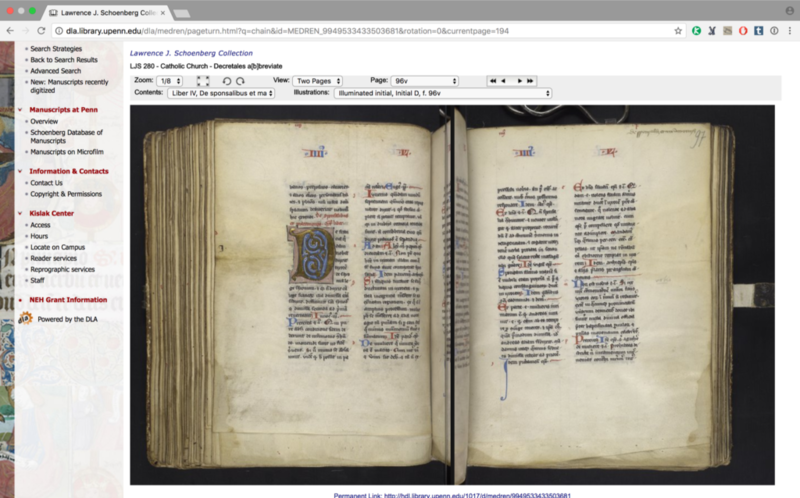 The first is from e-codices, and is their regular, purpose-built viewer. When you select the next page, the opening is simply replaced with the next opening (after a few seconds for loading). 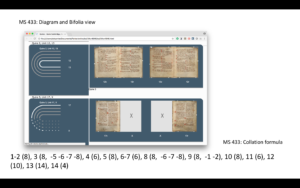 The second is also e-codices, but is from the Mirador viewer, a IIIF viewer that is being adopted by institutions and that can also be used by individuals. Similar to the other viewer, when you select the next page the opening is replaced with the next opening (and you can also track through the pages using the image strip along the bottom of the window). 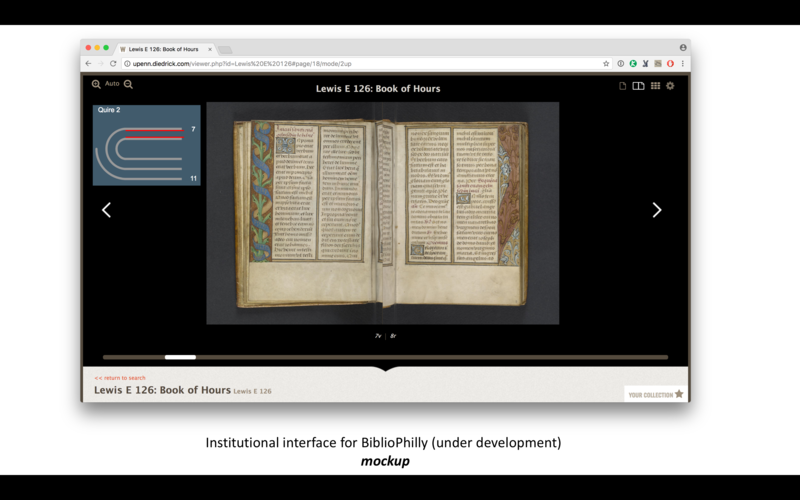 The next example is a Bible from Swarthmore College near Philadelphia, presented in the Internet Archive BookReader. This one is designed to mimic a physical page turning, but it simply tilts and moves the image. This would be fine (maybe a bit weird) if the image were text-only, but as the image includes the edges of the text-block and you can see a bit of the binding, the effect here is very odd. Finally, my old friend Turning the Pages (a newer version than the one I complained about in my 2009 paper), which works very hard to mimic the movement of a page turning, but doing so in a way that is unlike any manuscript I’ve ever seen. In fact, I predict that it is possible to create a safe level of affinity by deliberately pursuing a nonhuman design. I ask designers to ponder this. To illustrate the principle, consider eyeglasses. Eyeglasses do not resemble real eyeballs, but one could say that their design has created a charming pair of new eyes. So we should follow the same principle in designing prosthetic hands. In doing so, instead of pitiful looking realistic hands, stylish ones would likely become fashionable. And here’s an example of a very stylish prosthetic leg from the Alternative Limb Project, which specializes in beautiful and decidedly not realistic prosthetic limbs (and realistic ones too). This is definitely a leg, and it’s definitely not her real leg. Alternative interfaces that are obviously not attempting to show the whole manuscript but still illustrate something important about them (for example, RTI, MSI, or 3D models of single pages). This example is an interactive 3D image of the miniature of St. Luke from Bill Endres’s Manuscripts of Lichfield Cathedral project. I think these would plot out something like this on the graph. This is all I have to say about the uncanny valley and zombie books, but I’m looking forward to Johanna, Bridget and Angie’s contributions and to our discussion at the end. I also want to give a huge shout-out to Johanna and Bridget, to Johanna for conceiving of this session and inviting me to contribute, and both of them for being immensely supportive colleagues and friends as I worked through my thoughts about frankenbooks and zombie manuscripts, many of which, sadly, didn’t make it into the presentation, but which I look forward to investigating in future papers. 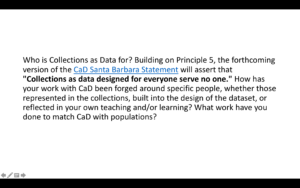 Following are my remarks from the Collections as Data National Forum 2 event held at the University of New Mexico, Las Vegas, on May 7 2018. Collections as Data is an Institute of Museum and Library Services supported effort that aims to foster a strategic approach to developing, describing, providing access to, and encouraging reuse of collections that support computationally-driven research and teaching in areas including but not limited to Digital Humanities, Public History, Digital History, data driven Journalism, Digital Social Science, and Digital Art History. The event was organized by Thomas Padilla, and I thank him for inviting me. It was a great event and I was honored to participate. 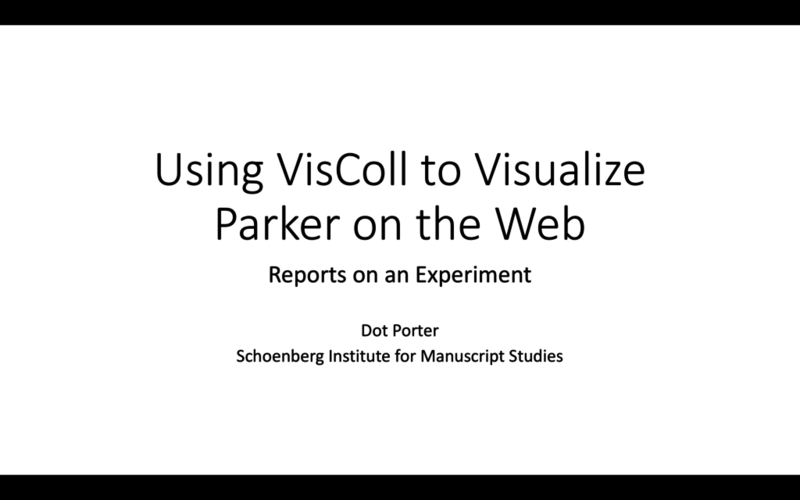 Today I’m going to be talking about curators as an audience for collections as data, using two projects from the University of Pennsylvania’s Kislak Center for Special Collections, Rare Books and Manuscripts as use cases. 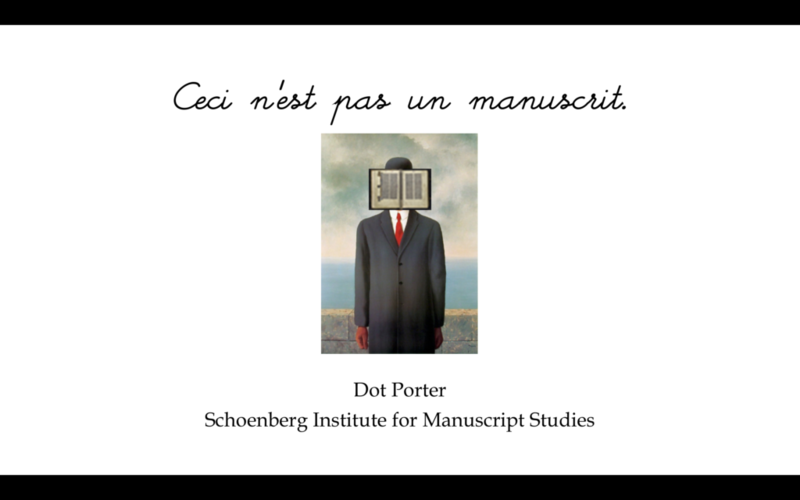 I am a curator in the Kislak Center, and most of my time I work on projects under the aegis of the Schoenberg Institute for Manuscript Studies, which is a unit under the Kislak Center. SIMS is a kind of research and development group (our director likes to refer to it as a think tank) that focuses on manuscript studies writ large, mostly but by no means only focused on medieval manuscripts from Europe, and that specializes in examining the relationship between manuscripts as physical objects and their digitized counterparts. 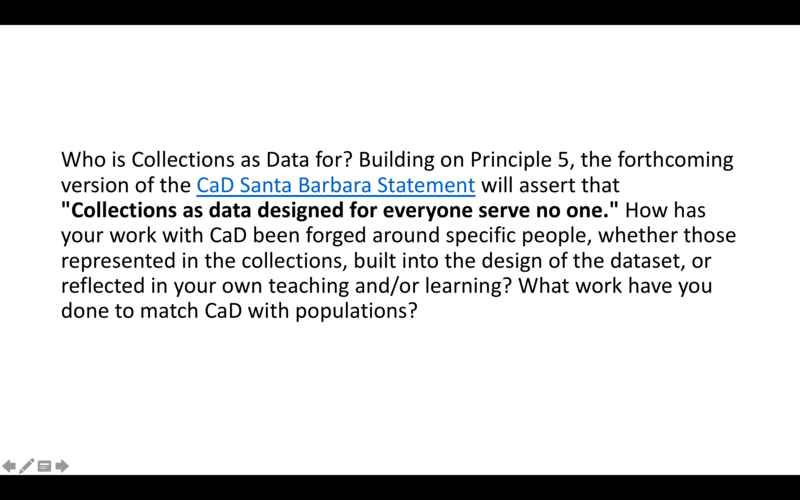 For this session, we’ve been asked to react to this assertion from the Collections as Data Santa Barbara Statement: Collections as data designed for everyone serve no one, and to discuss the audiences that our collections as data are built for. 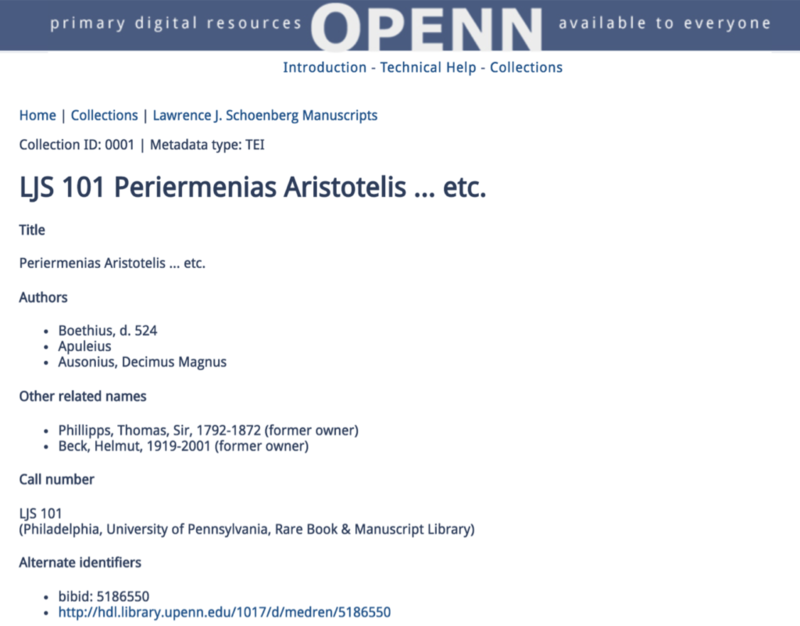 I’ll start with OPenn, which launched in May 2015 as an open access collection of Penn’s digitized manuscript material. 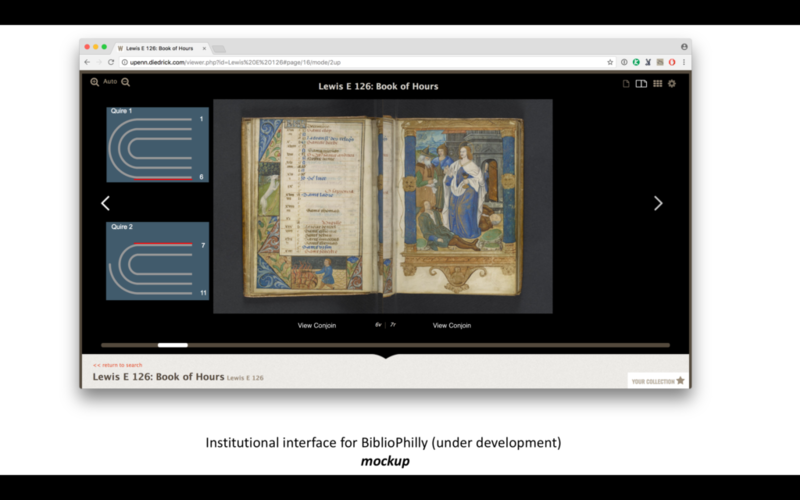 Penn started digitizing its manuscripts in the mid 1990s, but they had been virtually locked in a black box system. To create OPenn we cracked opened the box, generated new derivative images from the master TIFF files, generated TEI/XML manuscript description files using the data from our catalog and supporting databases, and put it all in a fully public file server. 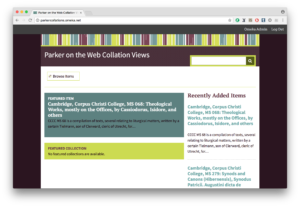 The collection navigation is provided by HTML pages – one that lists all the repositories, pages listing the manuscripts in each repository, and finally HTML pages for each manuscript presenting the catalog data and links to the image files. At the time OPenn launched, there was no search facility, although one has recently been added. 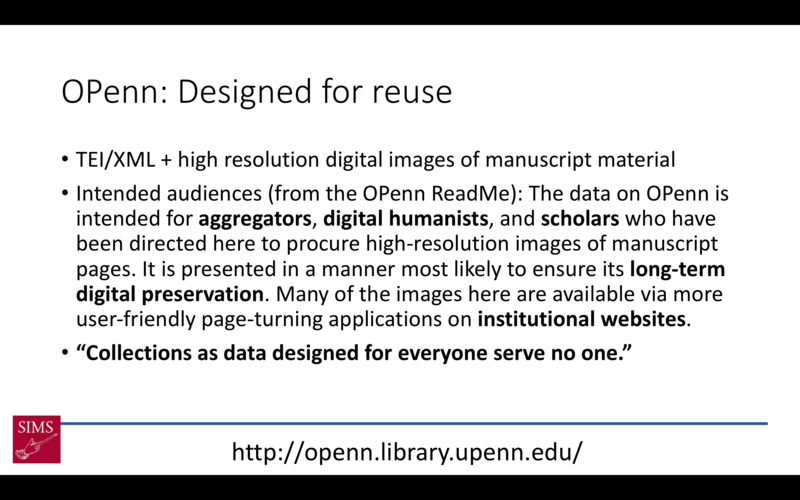 OPenn’s developer, Doug Emery, describes the access that OPenn provides as friction-free access, referring both to the licensing (the image files are in the public domain, the metadata is licensed cc:by) and to the technical access. There’s no login and no API. You can navigate to the site in a browser and download images, or you can point wget at the server and bulk download entire manuscripts. When we were designing OPenn, we weren’t thinking that much about the audience, honestly. 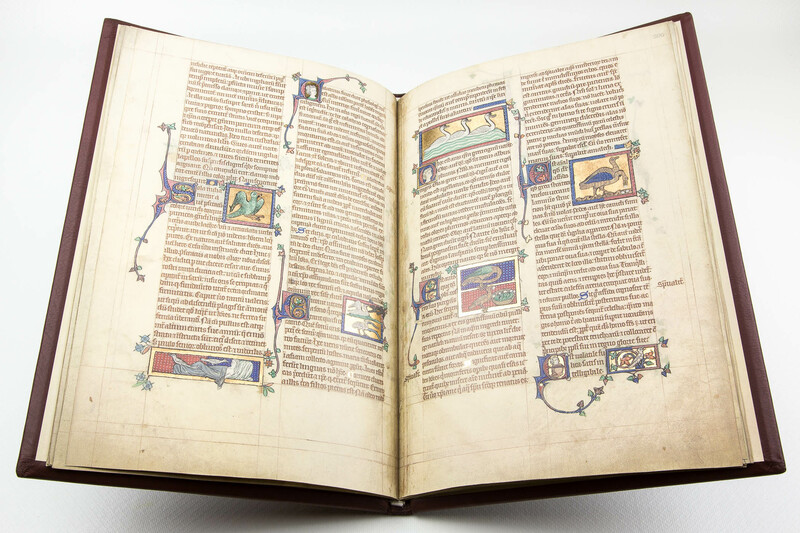 We were thinking about pushing the envelope with fully available, openly licensed, high resolution, robustly described and well-organized digitized medieval manuscripts. We did imagine who might use our collections, and how, and you can read the statement from our readme here on the screen. But I can’t say that we built the system to serve any audience in particular. 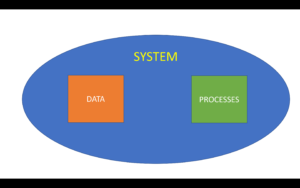 We did build the system in a way that we thought would be generally useful and usable. But it became clear after OPenn launched that our lack of an audience made it difficult for us to “sell” OPenn to any group of people. Medievalists, faculty and students, who might want to use the material, were put off by the relatively high technical learning curve, the simple interface (lacking the expected page-turning view) and by the lack of search (we do have a Google Search now, but it was only added to the site in the past month). 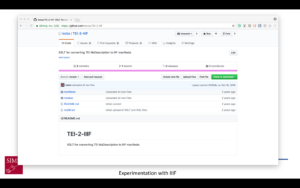 Data analysts who might want to visualize the collection-wide data were put off by the formatting of each manuscript having its own TEI file. Indeed data designed for everyone does seem to serve no one. But wait! Don’t lose hope! An accidental audience did present itself. In the months and into the first year after OPenn launched, it was slowly used as a source for projects. 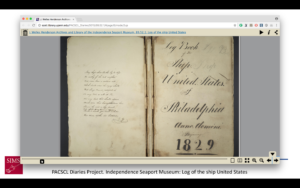 The Philadelphia Area Consortium of Special Collections Libraries, PACSCL, undertook a collaborative project whereby each member institution digitized five diaries from their collections, which were put on OPenn, the PACSCL Diaries Project. When the project went live, the folks at PACSCL wanted a user-friendly way to make the diaries available, so I generated page-turning interfaces using the Internet Archive Bookreader that pulled in metadata from the TEI files and that point to the image files served on OPenn. 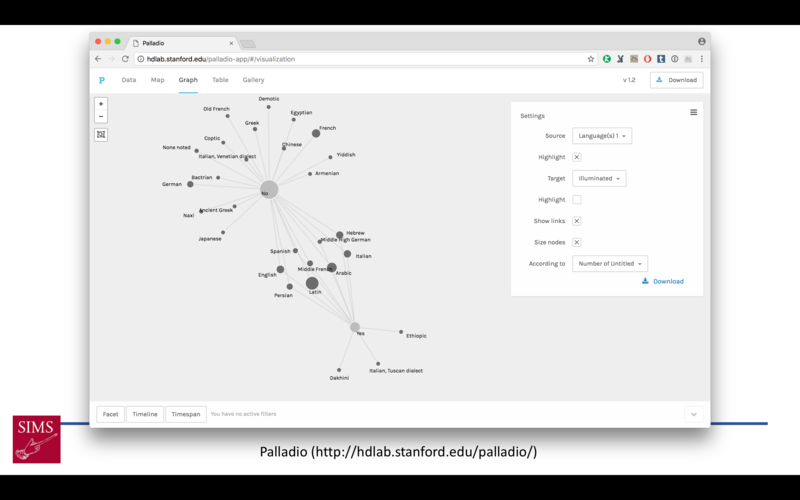 I combined the links to images on OPenn with data gathered through another SIMS project, VisColl (which I’ll describe in a bit more detail later) to generate a visualization of the gathering structure of manuscripts with the bifolia, or sheets, laid alongside. 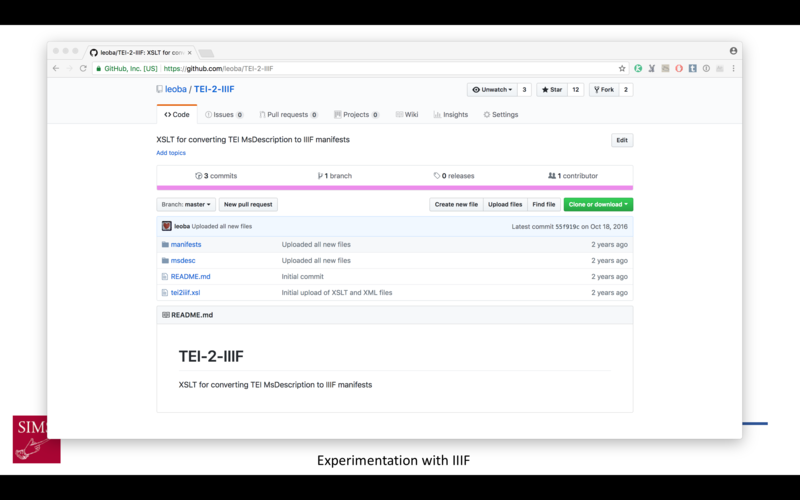 And last but not least, I experimented with setting up a IIIF image server that could serve the images from OPenn as IIIF-compatible images (this is a screenshot of the github site where I published IIIF manifests I generated as part of that project, but they don’t work because the server no longer exists). The accidental audience? It was me. I don’t remember thinking about or discussing with the rest of the team as we planned for OPenn how I might use it as part of my regular work. I was familiar with the concept of an open collection of metadata and image files online; OPenn was based on The Digital Walters, which both the Director of the Kislak Center Will Noel and Doug Emery had built when they were employed at the Walters Art Museum in Baltimore, and I had been playing with that data for a year before I was even hired at Penn. I must have know that I would use it, I just didn’t realize how much I would use it, or how having it available to me would change the way I thought about my work, and the way I worked with the collections. The things that made it difficult for other people to use OPenn – the lack of a search facility, the dependence on XML – didn’t affect me negatively. I already knew the collection, so a search wasn’t necessary; at the time OPenn launched I had been working with XML technologies for 10 years or so, so I was very comfortable with it. 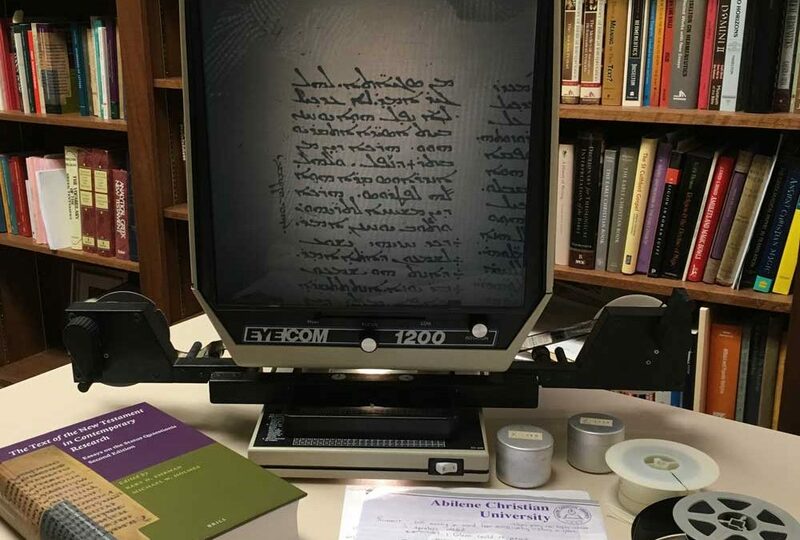 At the very end of 2015, several months after OPenn was launched, we, along with PACSCL, Lehigh University, and the Free Library of Philadelphia, were awarded a grant from the Council on Library and Information Resources under the “Digitizing Hidden Collections” program to digitize western Medieval manuscripts in 15 Philadelphia area libraries. 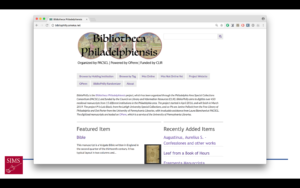 We call the project Bibliotheca Philadelphiensis, the “library of Philadelphia”, or BiblioPhilly for short. Working from my experience working with data on OPenn, during the six-month lead up to cataloging and digitization I was able to build the requirements for the BiblioPhilly metadata in a way to guarantee that the resulting data would be useful to me and to the curators and librarians at the other institutions. Some of the things we implemented include a closed list of keywords (based on the keyword list developed for the Digital Walters), in contrast with the Library of Congress subject headings in OPenn, and four different date fields (date range start, date range end, single date, and narrative date) with strict instructions for each (except for narrative date) to ensure that the dates will be computer readable. We have also integrated data from VisColl into BiblioPhilly, both into the data itself, and in combination with the data in the interfaces. 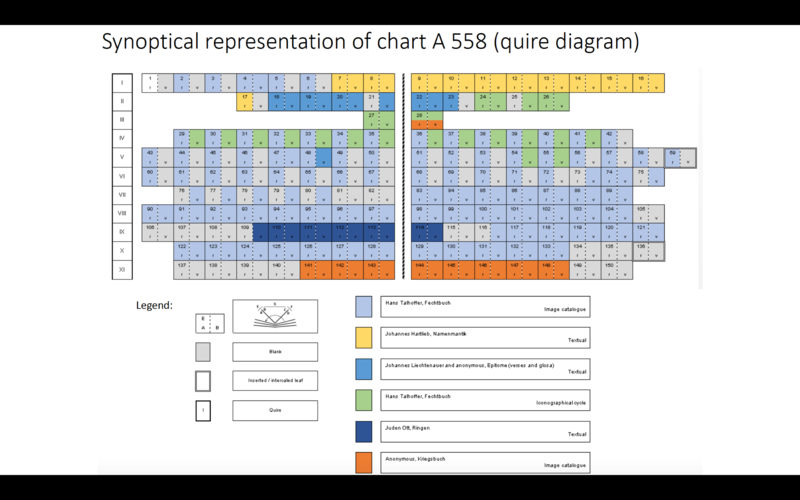 VisColl, as I mentioned before, is a system to model and visualize the quire structure of manuscripts. 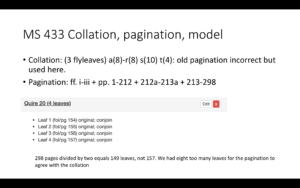 (A manuscript’s quire structure is called its collation, hence the name VisColl – visualizing collation) VisColl models are XML files that describe each leaf in a manuscript and how those leaves relate to each other (if they are in the same quire, or if they are conjoined, if a leaf is missing or has been added, etc.). 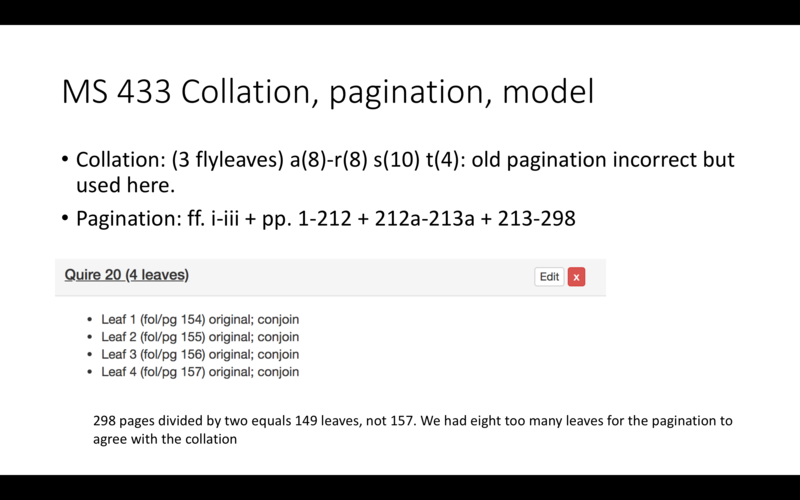 From a model we’re able to generate a concise description of a manuscripts’ construction, in a format referred to as a collation formula, and this formula is included in the manuscript’s cataloging and becomes part of the TEI manuscript description. 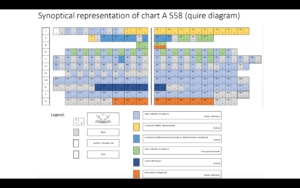 However we’re also able to combine the information from the collation model with the links to the image files on OPenn to generate views of a collation diagram alongside the sheets that make up the quires. 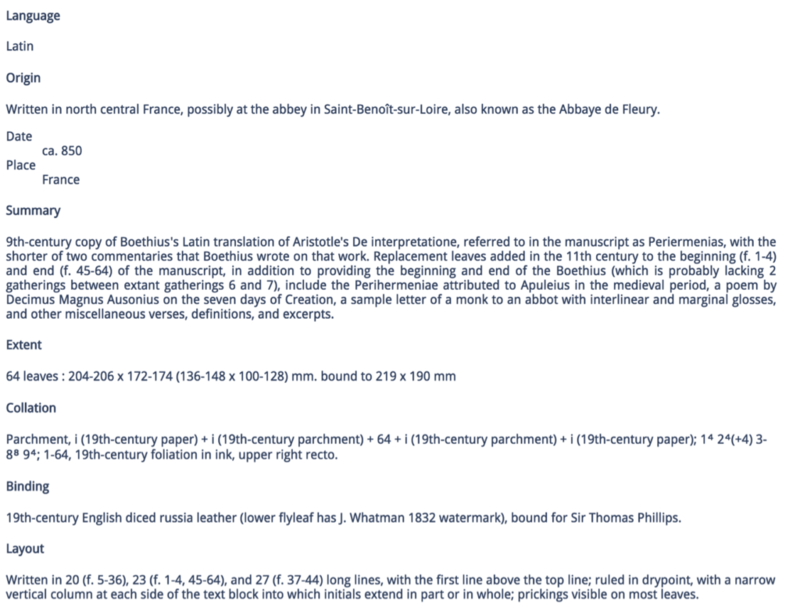 For BiblioPhilly, because of the experimentation we did with Penn manuscripts on OPenn, we’ve been able to make the digitized BiblioPhilly manuscripts available online in ways that are more user-friendly to non-technical users than OPenn is, even before we have an “official” project interface. We did this by building an In Progress Viewer relatively early on. 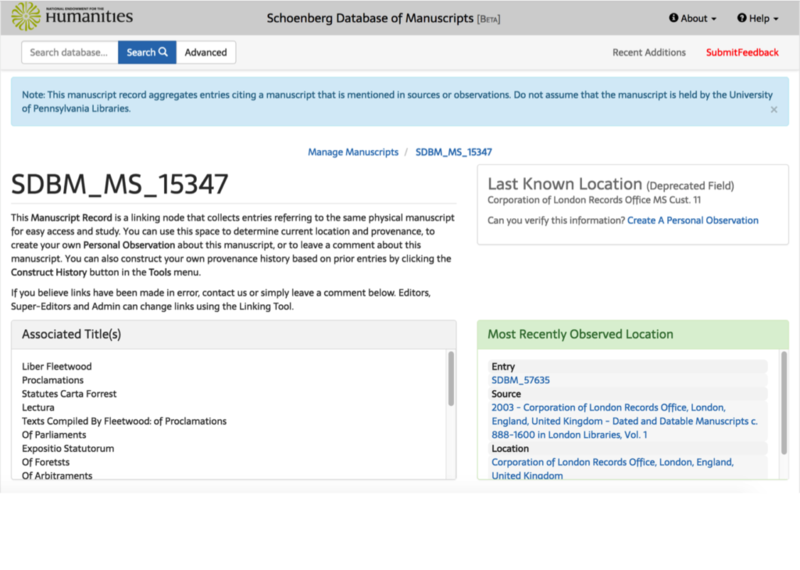 The aim of the In Progress viewer was 1) to provide technically simple, user-friendly ways to search, browse, and view the manuscripts, and 2) to make available information both about the manuscripts that were online, and about the manuscripts that had yet to go online (including the date they were photographed, so users can track manuscripts of particular interest through the process). 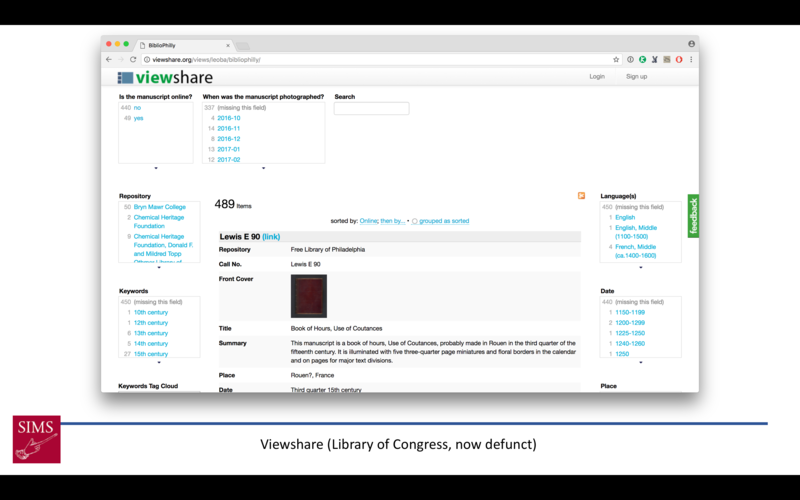 The first In Progress Viewer was built in the Library of Congress’s Viewshare, which provided federated browsing for all the fields in our records, along with a timeline and simple mapping facility. 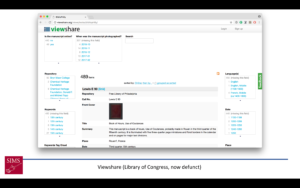 Unfortunately the Library of Congress is no longer supporting Viewshare, and when it went offline on March 20 we moved to an Omeka platform, which is more attractive but lacks the federated searching that made Viewshare so compelling. 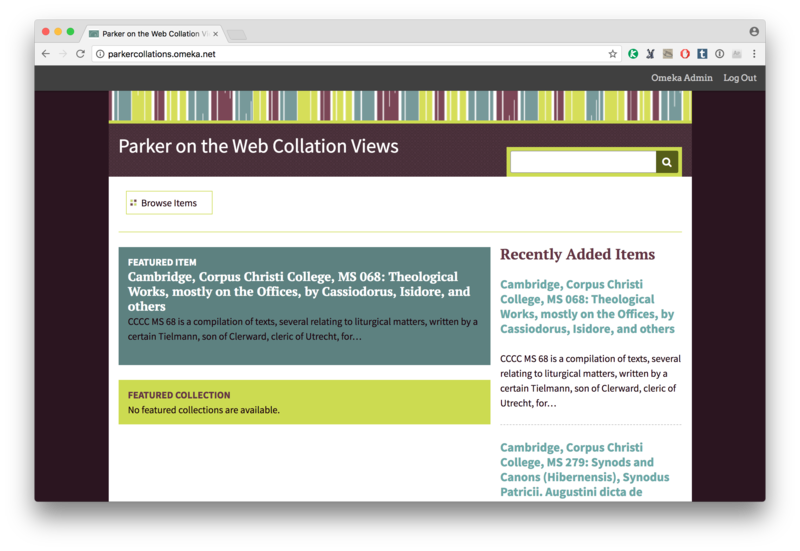 From Omeka (and Viewshare before it) we link to the manuscript data on OPenn, to Internet Archive BookReader page-turners, and to VisColl collation views. Both the BookReaders and VisColl views are generated locally from scripts and hosted on a Digital Ocean droplet. This is a temporary system, and is not built to last beyond the end of the project. It will be replaced by an official, longer-lived interface. 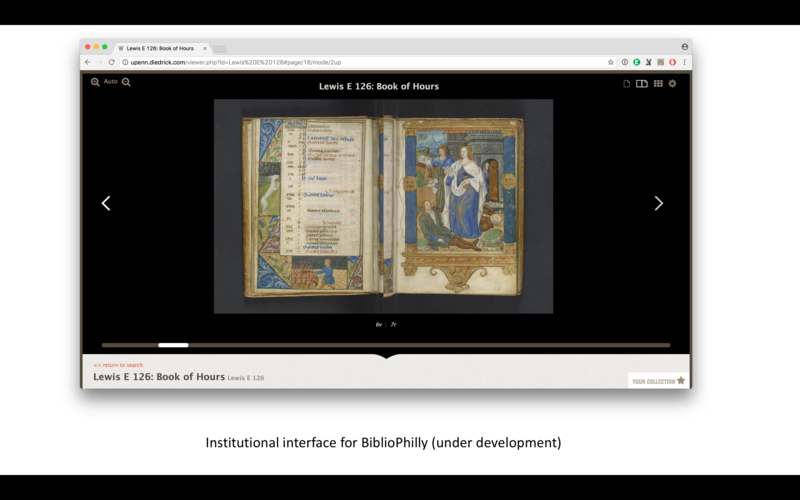 We’re also able to leverage the OPenn design of BiblioPhilly and VisColl for this “official” interface, which is currently under development with Byte Studios of Milwaukee, Wisconson. 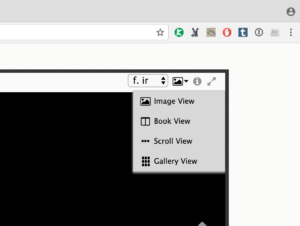 While our In Progress Viewer has both page-turning facility and collation views, those elements are separate and are not designed to interact. The interface that we are designing with Byte Studios incorporates the collation data with the page-turning and will allow a user to switch seamlessly between page openings and full sheets. It’s exciting that we’ve been able to leverage what was essentially an audience-less platform into something that can so well serve its curator, but there is a question that this approachpushes wide open: What does it mean to be a curator? 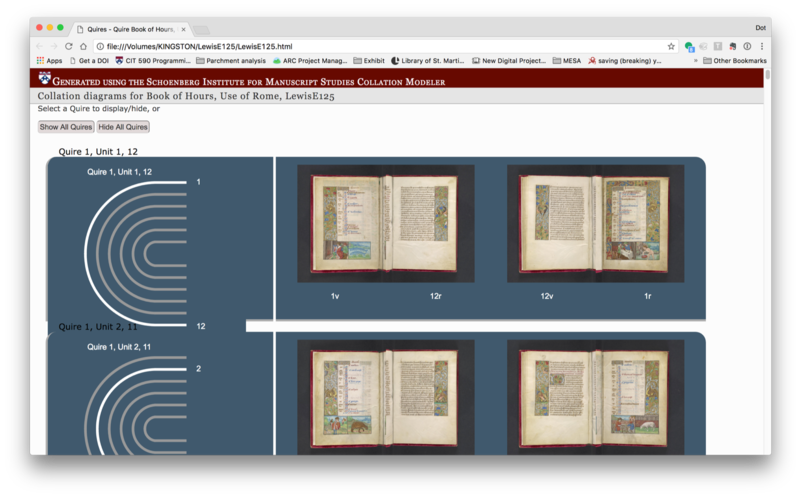 With a background in digital humanities focused on the development of editions of medieval manuscripts I was basically the perfect curator for OPenn. But that was a happy accident. 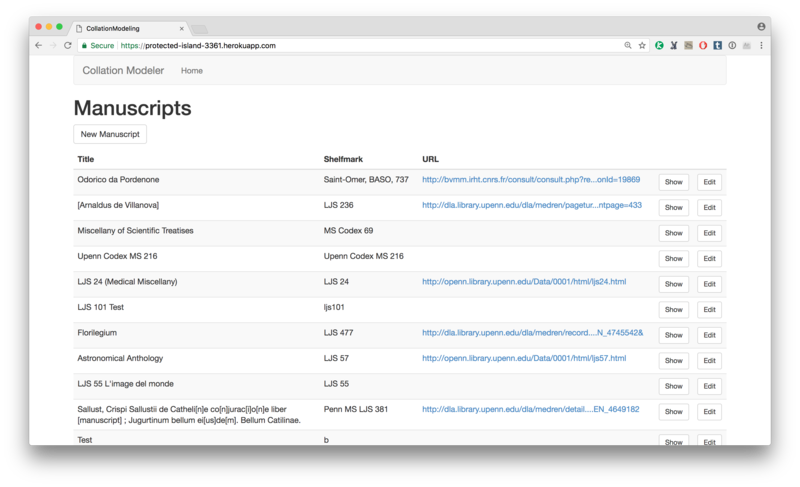 Most special collections curators don’t have my background or my technical training, so access to something like OPenn wouldn’t help them, and I’m very hesitant to suggest that every curator be trained in programming. I do think that every special collections department should have some in-house digital expertise, and maybe that’s the direction to go. Anyway, I’m very happy being in my current situation and I only wish we’d considered the curator as an audience for OPenn earlier in the process. In my talk for the Mellon Seminar I presented on three of my current projects, talked about what we gain and lose through digitization, and made a valiant attempt to relate my talk to the theme of the seminars for this semester, which is music and sound. (The page for the Mellon Seminars is here, although it only shows upcoming seminars.) I’m not sure how well that went, but I tried! I started my talk by pointing out that medieval manuscripts are physical objects – sometimes very large objects! They have weight and size and heft, and unlike static objects like sculptures, manuscripts move. They need to move in order for us to read them. 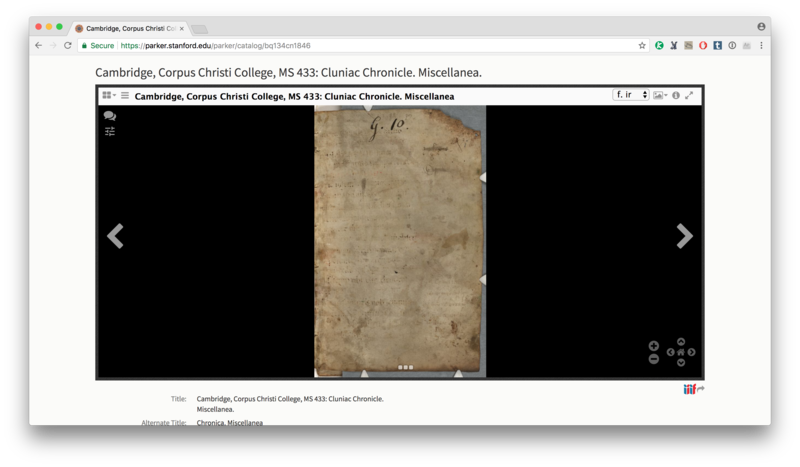 But digitized manuscripts – the ones you find for example in Penn in Hand, the page-turning interface for Penn’s digitized manuscript collection – don’t really move. Sure, we have an interface that gives the impression of turning the pages of the book, but those images are flat, static files that are just the latest version in a long history of facsimile copies of manuscripts. A page-turning interface for medieval manuscripts is the equivalent of taking a book, cutting the pages out, and then pasting those pages into a photo album. You can read the pages but you lose the sense of the book as a physical object. It sounds like I’m complaining, but I’m really not. 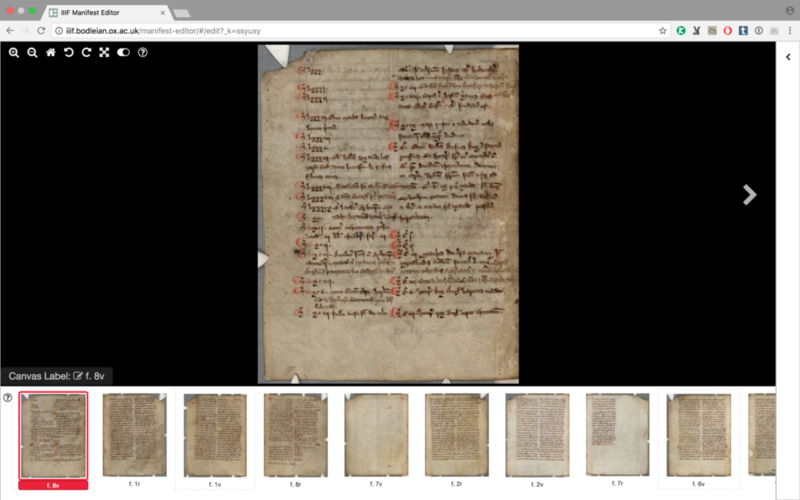 I like that digital photographs of manuscripts are readily available and relatively standard, but I do think it’s vitally important that people using them are aware of how they’re different from the “real” manuscript. 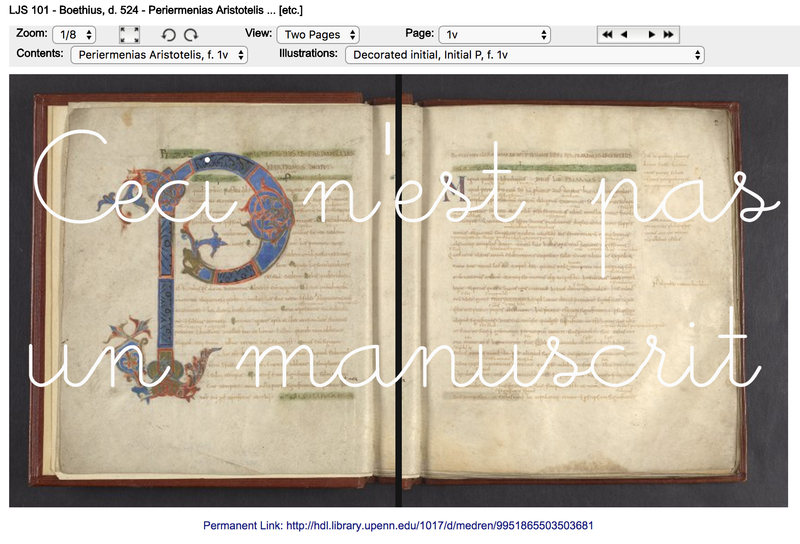 So in my talk I spent some time deconstructing a screenshot from a manuscript in Penn in Hand (see above). It presents itself as a manuscript opening (that is, two facing pages), but it should be immediately apparent that this is a fake. This isn’t the opening in the book, it’s two photos placed side-by-side to give the impression of the opening of the book. There is a dark line down the center of the window which clearly delineates the photo on the left and the one on the right. You can see two gutters – the book only has one, of course, but each photo includes it – and you can also see a bit of the text on the facing page in each photo. From the way the text is angled you can tell that this book was not laid flat when it was photographed – it was held at or near a 90 degree angle (and here’s another lie – the impression that the page-turning interface gives us is that of a book laid flat. Very few manuscripts lay flat. So many lies!). 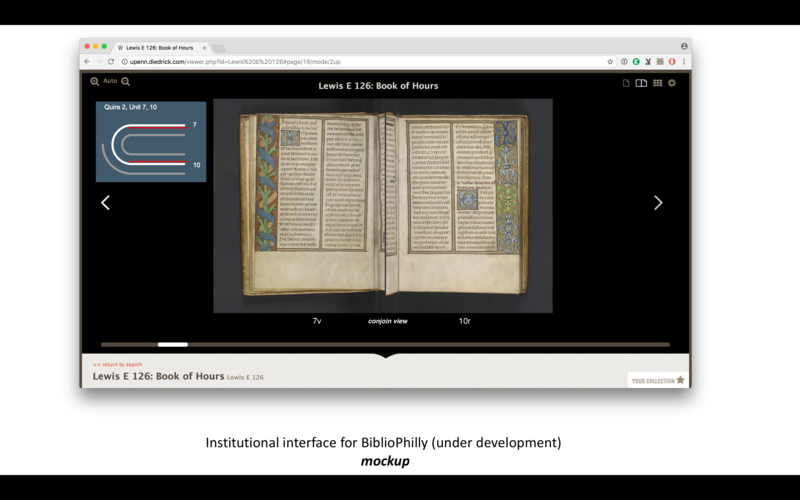 I moved from talking about how digital images served through page-turning interfaces provide one kind of mediated (~fake~) view of manuscripts to one of my ongoing projects that provides another kind of mediated (also fake?) view of manuscripts: video. 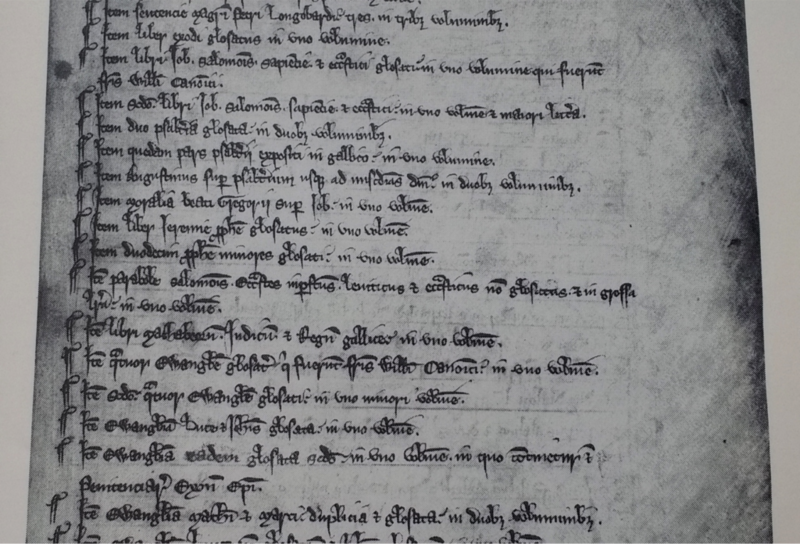 I could talk and write for a long time about manuscript videos, and I am trying to summarize my talk and not present it in full, so I’ll just say that one advantage that videos have over digitized images is that they do give an impression of the “real” manuscript: the size of them, the way they move (Is it stiff? How far can it open? Is the binding loose or tight? ), and – relevant to the Seminar theme! – how they sound. I didn’t really think about it when I started making the videos four years ago, but if you listen carefully in any of the videos you can hear the pages (and in some cases the bindings), and if you listen to several of them you can really tell the difference between how different types of parchment and paper sound. Our complete YouTube playlist of video orientations is here, but I’ll embed one of my favorites here. This is LJS 280, a 13th century copy of Decretales Gregorii IX in a 15th century chain binding that makes a lot of noise. I don’t want to imply that videos are better than digital images – they just tell us something that digital images can’t. And digital images are useful in ways that videos aren’t. For one thing, if you’re watching a video you can see the way the book moves, but I’m the one moving it. It’s still a mediated experience, it’s just mediated in a different way. You can see how it moved at a specific time, in a specific situation, with a specific person. 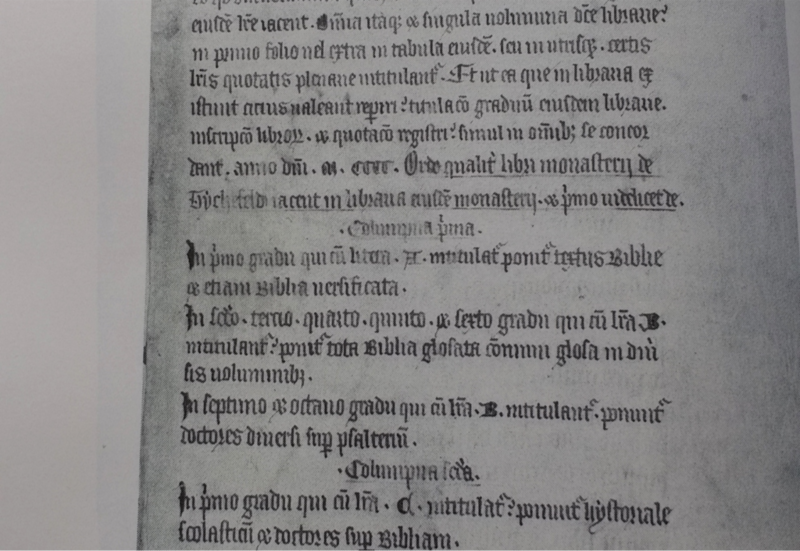 If you want to see folio 45v, you’re out of luck, because I didn’t turn to that page (and even if I had, the video resolution might not be high enough for you to read it; the video isn’t for reading – that’s why we have the digital images). There’s another problem with videos. In four years of the video orientation program, we have 74 videos online. We could have more if we made it a higher priority (and arguably we should), but each one takes time: for research, to set up and take down equipment, for the recording (sometimes multiple takes), and then for the processing. The videos are also part of the official record of the manuscript (we load them into the library’s institutional repository and link them to records in the library’s catalog) and doing that means additional work. 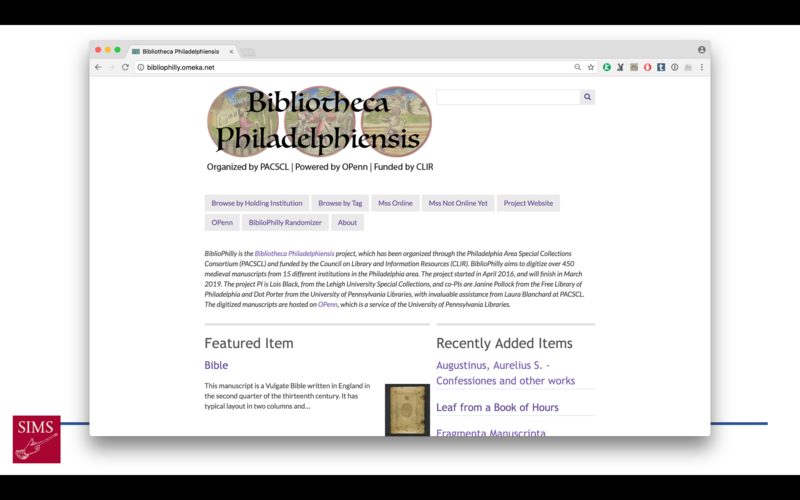 At this point I left videos behind and went back to digital images, but a specific project: Bibliotheca Philadelphiensis, which we call BiblioPhilly. 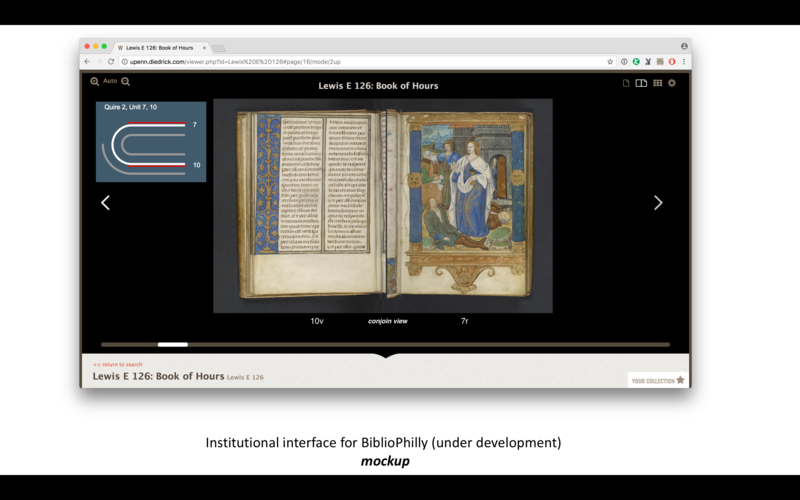 BiblioPhilly is a major collaborative project to digitize medieval manuscripts from institutions across Philadelphia, organized by the Philadelphia Area Consortium of Special Collections Libraries (PACSCL) and funded by the Council on Library and Information Resources (CLIR). We’re just entering year three of a three-year grant, and when we’re done we’ll have 476 manuscripts online (we have around 130 online now). If you’re interested in checking out the manuscripts that are online, and to see what’s coming, you can visit our search and browse site here. 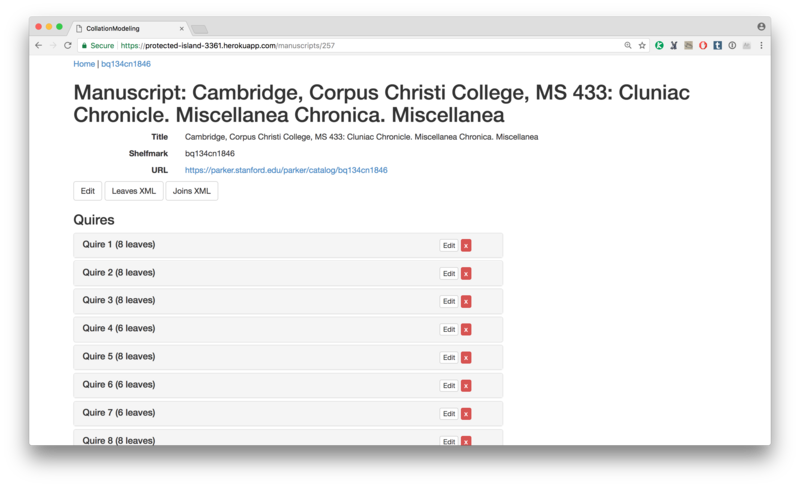 The relevance of BiblioPhilly in my talk is that we’re being experimental with the kind of data we’re creating in the cataloging work, and with how we use that data to provide new and different manuscript views. 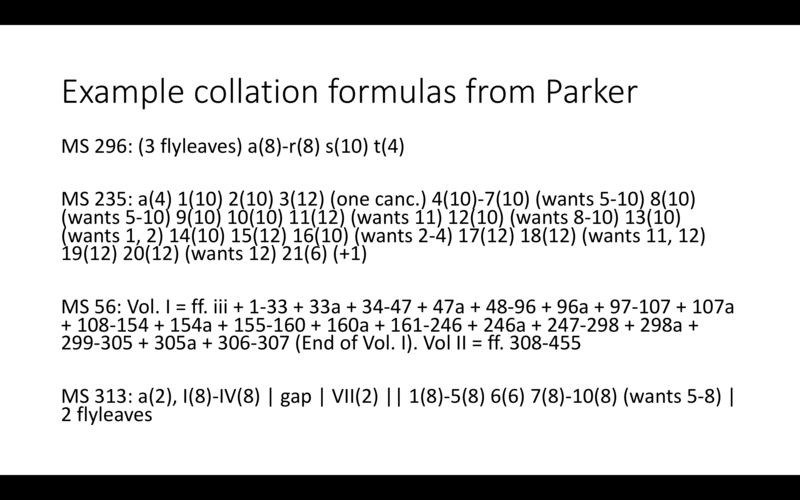 The formula is standardized for printed books, but not for manuscripts. 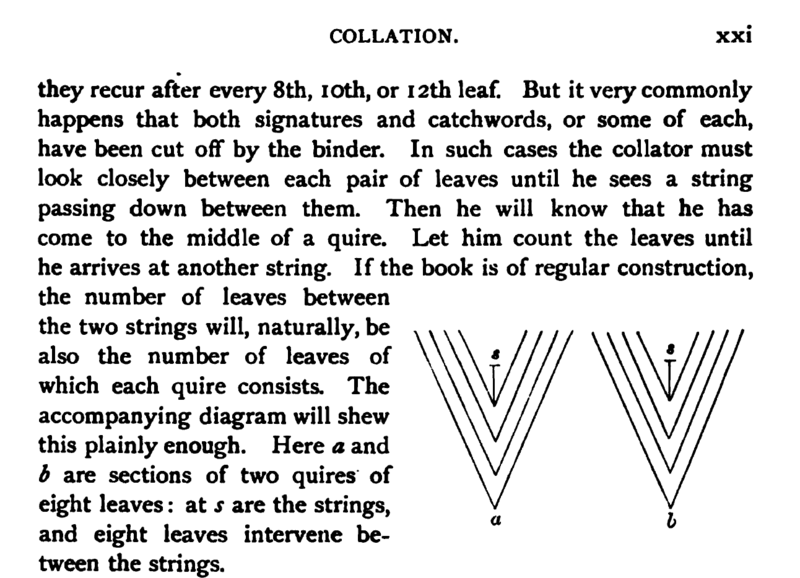 Following that link will take you to a page where you can see diagrams showing each quire, and image files organized to show how the leaves are physically connected through the quire (that is, the sheets that were originally bound together to form the quire). Like the page-turning interface, this is giving us a false impression of what it would be like to deconstruct the manuscript and view it in a different way, but like the video is it also giving us a view of the manuscript that is based in some way on its physicality. And this is where my talk ended. We had a really excellent question and answer session, which included a question about why I don’t wear gloves in the videos (my favorite question, which I answer here with a link to this blog post at the British Library) but also a lot of great discussion about why we digitize, and how, and why it matters, and how we can do it best. Thanks so much to Glenda Goodman and Stewart Varner for inviting me, and to everyone who showed up. This week I participated in a workshop organized by the Collections as Data project at the annual meeting of the American Historical Association in Washington, DC. The session was organized by Stewart Varner and Laurie Allen, who introduced the session, and the other participants were Clifford Anderson and Alex Galarza. The stated aim of the session was “to spark conversations about using emerging digital approaches to study cultural heritage collections,” (I’ll copy the full workshop description at the end of this post) but all of our presentations ended up focusing on the labor involved in developing our projects. This was not planned, but it was good, and also interesting that all of us independently came to this conclusion. Clifford’s presentation was about work being done by the Scholarly Communications team at Vanderbilt University Libraries as they convert data from legacy projects (which have tended to be purpose built, siloed, and bespoke) into more tractable, reusable open data, and Alex told us about the GAM Digital Archive Project, which is digitizing materials related to human rights violations in Guatemala. Both Clifford and Alex stressed the amount of time and effort it takes to do the work behind their projects. The audience was mainly history faculty and maybe a few graduate students, and I expect they, like me, wanted to make sure the audience understood that the issue of where data comes from is arguably more important than the existence of the data itself. 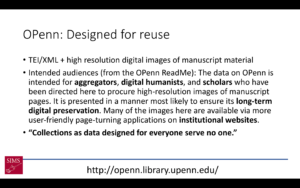 My own talk was about the University of Pennsylvania’s OPenn (Primary Digital Resources for Everyone), which if you know me you probably already know about. OPenn is the website in which the Kislak Center for Special Collections, Rare Books and Manuscripts publishes its digitized collections in the public domain, as well as hosting collections for many other institutions. This includes several libraries and archives around Philadelphia who are partners on the CLIR-funded Bibliotheca Philadelphiensis project (a collaboration with Lehigh University, the Free Library of Philadelphia, Penn, and the Philadelphia Area Consortium of Special Collections Libraries), which I always mention in talks these days (I’m a co-PI and much of the work of the project is being done at Penn). I also focused my talk on the labor of OPenn, mentioning the people involved and including slides on where the data in OPenn comes from, which I haven’t mentioned in a public talk before. 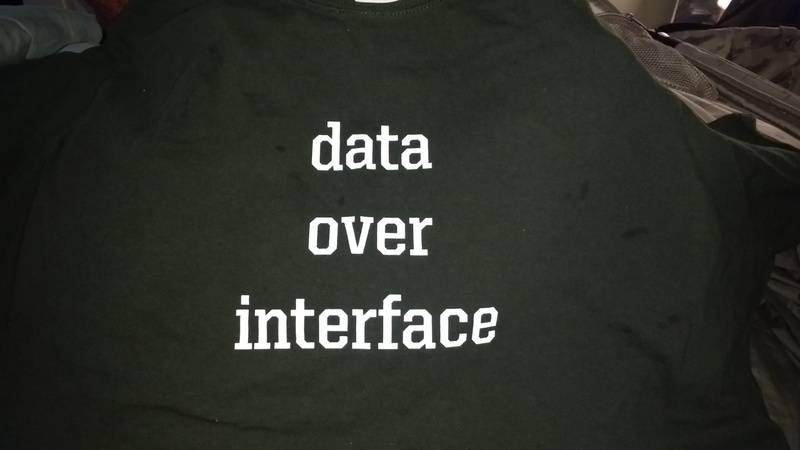 Ironically I ended up spending so much time talking about what OPenn is and how it works that I didn’t have time to show much of the data, or what you can do with it. But that ended up fitting the (unplanned) theme of the workshop, and the attendees seemed to appreciate it, so I consider it a success. The purpose of this workshop is to spark conversations about using emerging digital approaches to study cultural heritage collections. 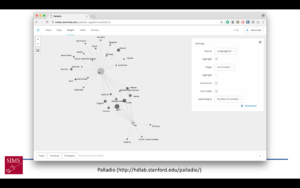 It will include a few demonstrations of history projects that make use of collection materials from galleries, libraries, archives, or museums (GLAM) in computational ways, or that address those materials as data. The group will also discuss a range of ways that historical collections can be transformed and creatively re-imagined as data. The workshop will include conversations about the ethical aspects of these kinds of transformations, as well as the potential avenues of exploration that are opened by historical materials treated as data. Part of an IMLS-funded National Digital Forum grant, this workshop will ultimately inform the development of recommendations that aim to support cultural heritage community efforts to make collections collections more readily amenable to computational use. The text of a lightning talk originally presented at The Futures of Medieval Historiography, a conference at the University of Pennsylvania organized by Jackie Burek and Emily Steiner. Keep in mind that this was very lightly researched; please be kind. Rather than the originally proposed topic, the historiography of medieval manuscript descriptions, I will instead be talking about the historiography of medieval manuscripts specifically in England and the USA, as perceived through the lens of manuscript descriptions. 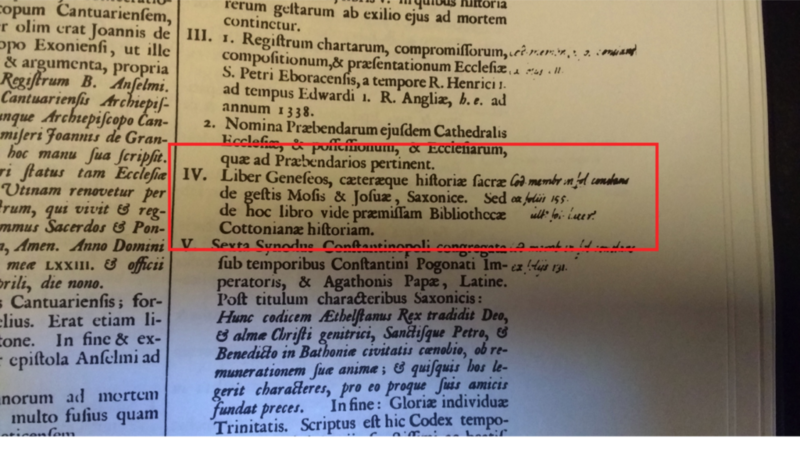 We’ll start in the late 12th into the 15th century, when monastic houses cataloged the books in their care using little more than a shelf-list. Such a list would be practical in nature: the community needs to be able to know what books they own, so as books are borrowed internally or loaned to other houses (or perhaps sold) they have a way to keep track of them. 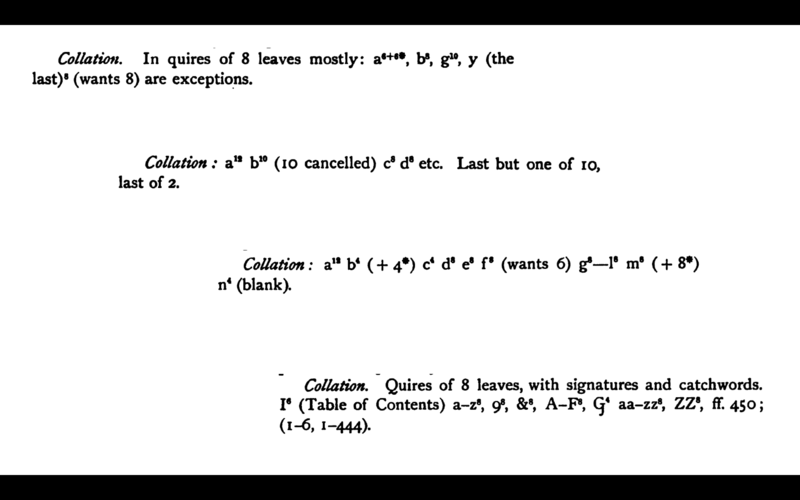 Entries on the list would be very simple: a brief statement of contents, and perhaps a note on the number of volumes. There is, of course, an entire field of study around reconstructing medieval libraries using these lists, and as the descriptions are quite simple it is not an easy task. In the 15th and 16th centuries there were two major historical events that I expect played a major role both in a change in the reception of manuscripts, and in the development of manuscript descriptions moving forward: those are the invention of the printing press in the mid-15th century, and the dissolution of the monasteries in the mid-16th century. The first made it possible to relatively easily print multiple copies of the same book, and also began the long process that rendered manuscripts obsolete. The second led to the transfer of monastic books from institutional into private hands, and the development of private collections with singular owners. When it came to describing their books, these collectors seemed to be interested in describing for themselves and other collectors, and not only for the practical purpose of keeping track of them. 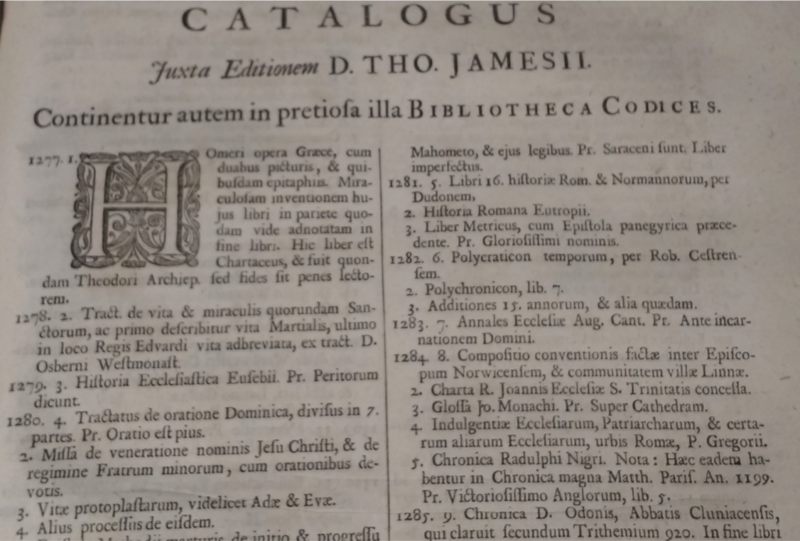 Here is a 1697 reprint of a catalog published in 1600 of Matthew Parker’s private collection (bequeathed to Corpus Christi College Cambridge in 1574). 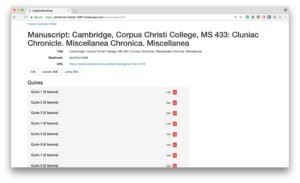 You can see that the descriptions themselves are not much different from those in the manuscript lists, but the technology for sharing the catalog – and thus the audience for the catalog – is different. In the later 16th and into the 17th century these private manuscript collections began to be donated back to institutions (educational and governmental), leading to descriptions for yet other audiences and for a new purpose: for institutions to inform scholars of what they have available for their use. The next three examples, from three catalogs of the Cotton Collection (now at the British Library) reflect this movement. The first is from a catalogue published in 1696, the content description is perhaps a bit longer than the earlier examples, and barely visible in the margin is a bit of a physical description: this is a codex with 155 folios. Notably this is the first description we’ve looked at that mentions the size of the book at all, so we are moving beyond a focus only on content. This next example, from 1777, is notable because it completely forefronts the contents. 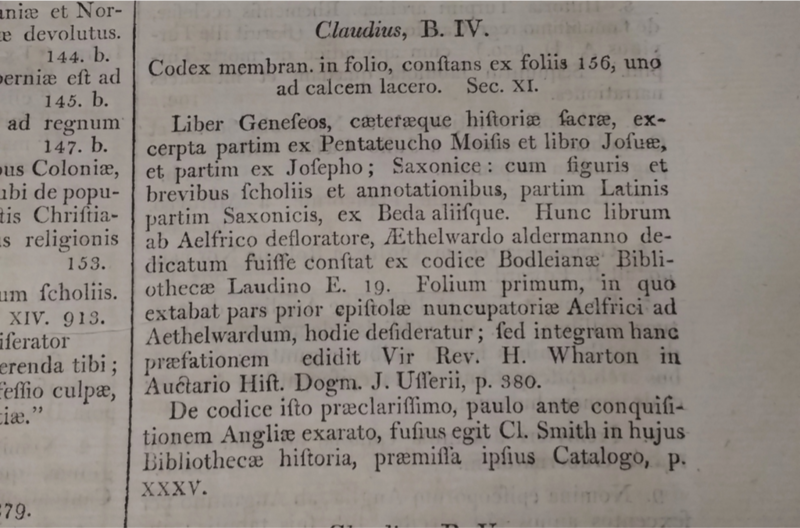 This catalog as a whole is organized by theme, not by manuscript (you can see below the contents listed out for Cotton Nero A. i), so we might describe it as a catalog of the collection, rather than a catalog of the manuscripts comprising the collection. 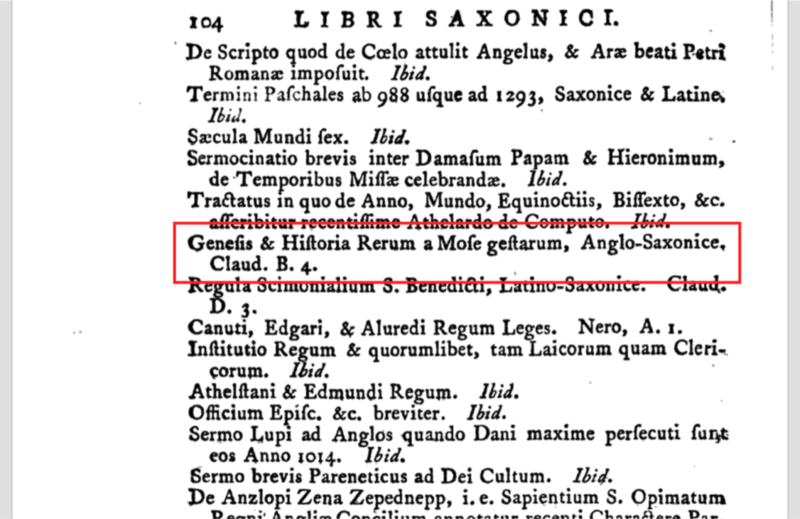 The third example is from the 1802 catalog, and although it’s still in Latin we can see that there is more physical description as well as more detail about the contents and appearance of the manuscript. There is also a citation to a book in which the preface on the manuscript has been published – the manuscript description is beginning to look a bit scholarly. We’ll jump ahead 150 years, and we can see in that time that concern with manuscripts has spread out from the institution to include the realm of the scholar. 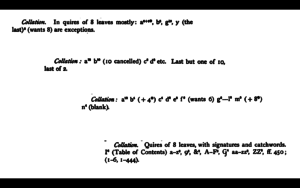 This example is from N.R. 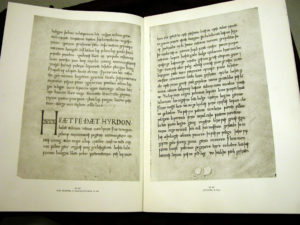 Ker’s Catalogue of Manuscripts Containing Anglo-Saxon, rather than focusing on the books in a particular collection it is focused on a class of manuscripts, regardless of where they are physically located. The description is in the vernacular, and has more detail in every regard. The text is divided into sections as well: General description; codicological description; discussion of the hands; and provenance. 1957. 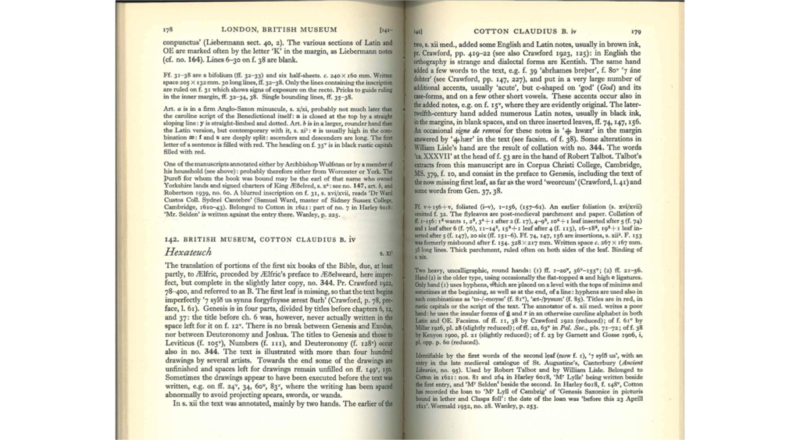 N. R. Ker, Catalogue of Manuscripts Containing Anglo-Saxon. Oxford, 1957. And now we arrive at today, and to the next major change to come to manuscript descriptions, again due to new technology. Libraries around the world, including here at Penn, are writing our manuscript descriptions using code instead of on paper, and publishing them online along with digital images of the manuscript pages, so people can not only read about our manuscripts, but also see images of them and use our data to create new things. 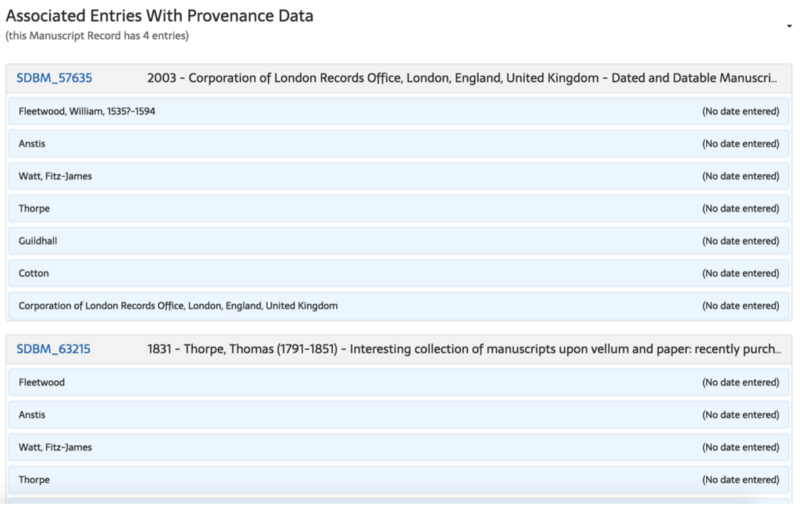 We use the data ourselves, for example in OPenn (Primary digital resources available to everyone!) we build websites from our manuscript descriptions to make them available to the widest possible audience. I want to close by giving a shout-out to the Schoenberg Database of Manuscripts, directed by Lynn Ransom, which is pushing the definition of manuscript descriptions in new scholarly directions. In the SDBM, a manuscript is described temporally, through entries that describe where a book was at particular moments in time (either in published catalogs, or through personal observation). As scholarly needs continue to change, and technology makes new things possible, the description of manuscripts will likewise continue to change around these, even as they have already over the last 800 years.